LÄRABAR has been apart of my blog for the past six years. No matter what lifestyle change I make, they always fit right in. 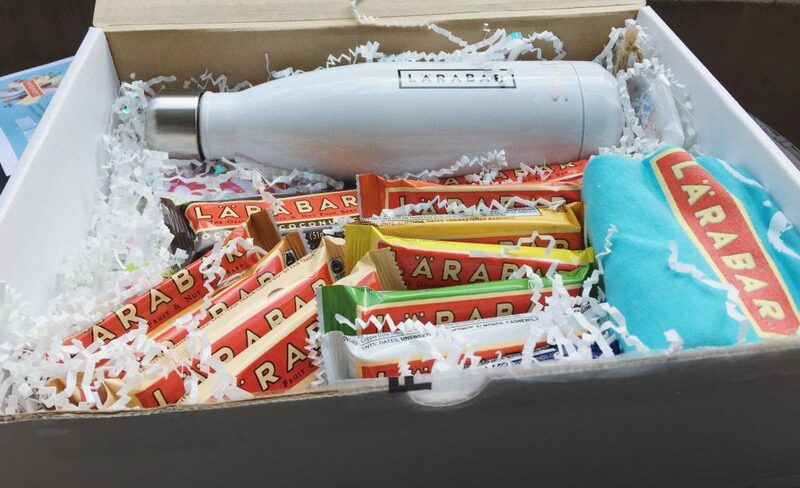 I am teaming up with LÄRABAR today for a giveaway + to show you how I fit the delicious bars into my lifestyle. LÄRABAR is food made from food and almost accessable for all – like all food should be! I live a very active lifestyle. I am always on the go, working out, or traveling. I love that I can take the bars anywhere. They do not need to be refrigerated, most of the flavors won’t melt in my backpack, and I can find them almost anywhere! My most favorite LÄRABAR flavor is the Chocolate Chip Cookie Dough! It’s the one I always recommend. I love chocolate, so I try to have this flavor for dessert intead of reaching for the cookie jar after dinner. The crazy thing about this bar is that it only has four ingredients. It has cashews, dates, chocolate chips, and sea salt. All of the LÄRABAR bars stick to 2-9 ingredients. 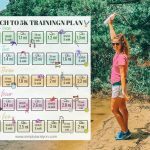 I have been training for a half marathon for the past five months. Not only is stretching, drinking water, and foam rollers important, but so are post and pre workout fuel. I have been using the LÄRABAR bars for pre and post workout fuel for years. They have the perfect amount of carbohydrates and fat (for energy), protein and sugar (for recovery)! Depending on how long my run is, I’ll eat half before and half after, or one before and one after! 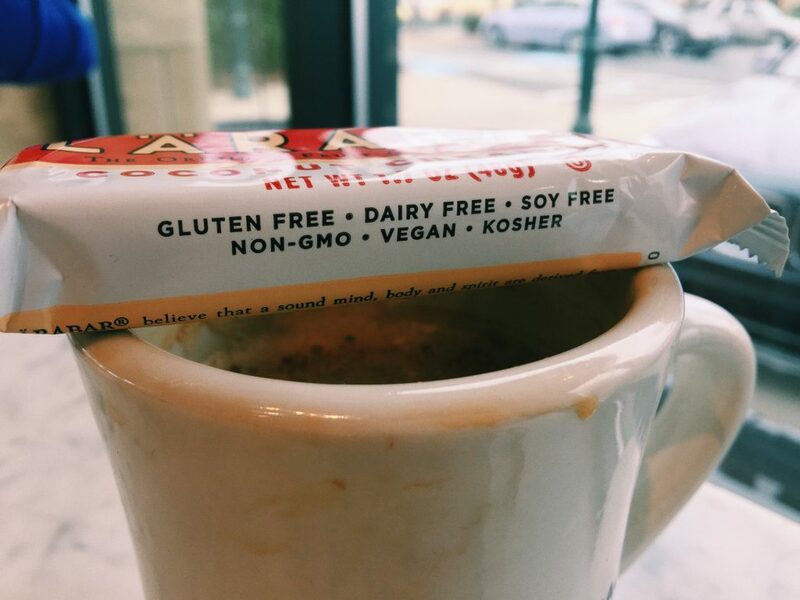 The reason LÄRABAR is so accessable for most people is because their products are gluten-free, Kosher, and non-GMO. They offer a lot of vegan, dairy-free and soy-free options! It makes healthy snacking so much easier. Food is your best friend when you are training. You should make sure to pack snacks with you on long hikes, trail runs, or just because. I am the only one in my friend’s group that doesn’t experience feeling “hangry”, but I ALWAYS keep snacks in my purse for those friends. 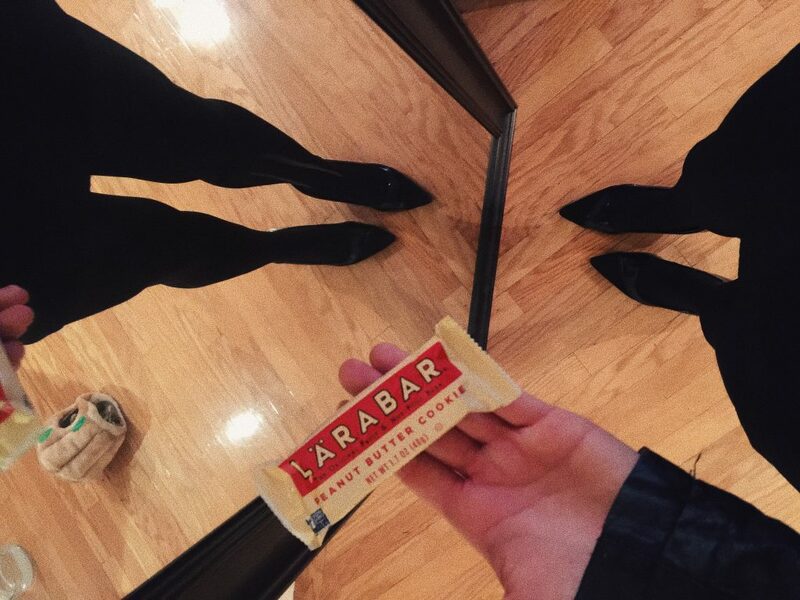 LÄRABAR bars are great for the hangry friends because they won’t melt and get your purse all gross! They have all the healthy ingredients and key nutrients to make you feel good and energized! I had an eight mile run planned on Thursday, so I had a high-fuel breakfast. I had coffee with three tablespoons of protein powered blended in, water, and a blueberry muffin LÄRABAR! 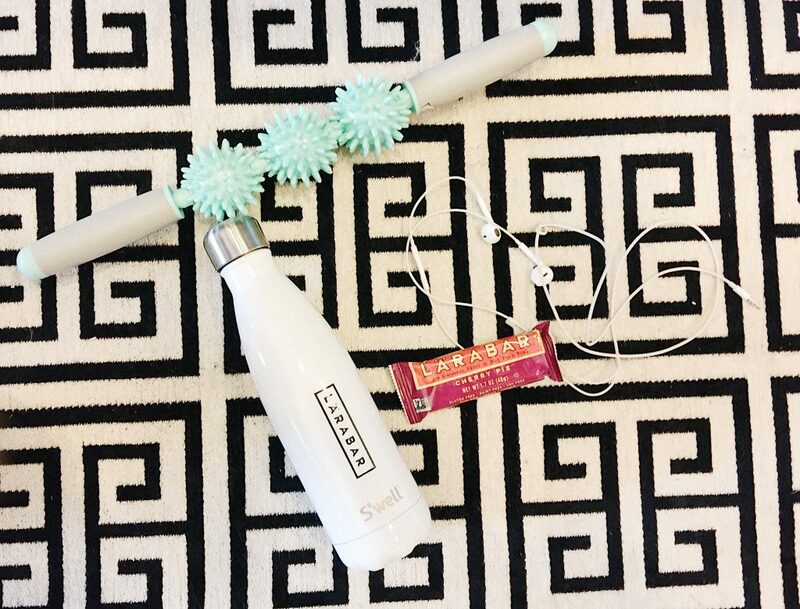 The LÄRABAR bars have all the healthy carbs for an energetic run. I love that they are packed with nutrients, but not heavy on the stomach before a workout. My run felt so great! My plan was to go eight light miles. That means running for a longer period of time, which burns more calories and requires more energy. It never hurts to bring your snacks to games and events either! I would LOVE to eat all the nachos, cheese dogs, and popcorn at the games, but it doesn’t fit into my healthy lifestyle at the moment. I’ve been working so hard to crush goals, and those types of food only makes me feel sluggish. When I’m at basketball games or football games, the smells of the food always make me hungry! 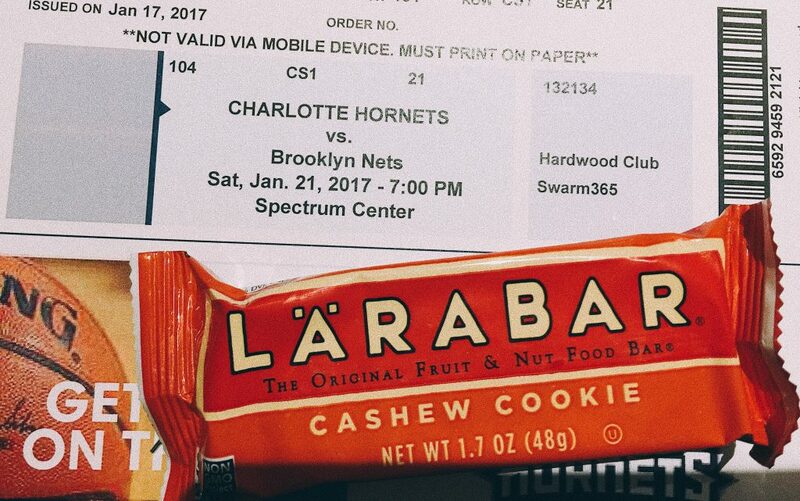 Having the LÄRABAR bar in my purse saved me from going straight to concessions and eating all the nachos that I desired. My pre-run fuel/breakfast was a peanut butter chocolate chip LÄRABAR bar. The run felt so great and I was so happy we had time to fit it in. I was hungry by the time we got to the mall so I grabbed a vitamin C energy boost water and ate the Lemon LÄRABAR hiding away in my purse. Those two bars made up for all the energy I burned during my workout. I needed all the fuel I could get because I had only one hour to shower and get ready for the wedding. This is why it should be called the “Lifestyle” bar. I packed a peanut butter cookie LÄRABAR bar in my purse just incase I was hungry before the reception. It ended up saving one of my friends who was hangry and struggling. Like I said before, ALWAYS pack snacks for your friends! I always have to eat first thing in the morning. When I wake up, I’m starving! 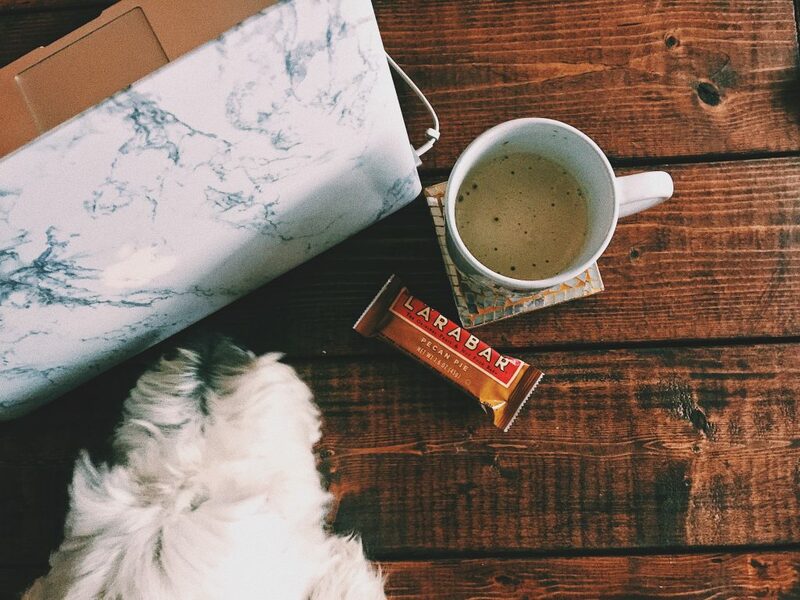 I usually have half a LÄRABAR bar with my cup of coffee. This may sound strange, but I actually keep them in my freezer! I love them cold. I was so impressed with the Banana Bread flavor! It’s only made up of three ingredients! Dates, Bananas, and Almonds! I would eat this before actual banana bread any day. A lot of people think that packaged food is unhealthy. LÄRABAR is the opposite and proof that it is VERY possible to get REAL food from a package. I have tried most of the LÄRABAR bars but there are some flavors still on my bucket list. I haven’t tried the carrot cake, peanut butter & jelly, or chocolate chip brownie yet! I cannot wait to get my hands on them. Just be careful because your will PUPS love them too! I’d be lying if I said I didn’t break off a piece for them too. LÄRABAR is giving my readers a chance to win an awesome prize pack & it’s so easy to enter! Comment back on this blogpost with your favorite flavor’s ingredients! This is a sponsored post brought to you by LARABAR, but all opinions are my own. Oh yum yum yum! So hard to pick just one but the PINEAPPLE KALE CASHEW really caught my eye. It’s still January 31st on the West Coast 🙂 Cannot beat coconut, so my favorite is coconut chocolate chip with just 5 ingredients: cashews, unsweetened coconut, semi sweet chocolate chips, almonds, and dates! Definite favorite is Chocolate Chip Brownie, ingredients – dates, chocolate chips, almonds, walnuts, cocoa powder, and sea salt! Oh, my favorite hands down is the Coconut Chocolate Chip! I’m new to Larabar but absolutely in love with the coconut chocolate chip (dates, chocolate chips, unsweetened coconut, cashews, almonds). They keep me from eating out of boredom at work and make a great pick me up snack. I am obsessed with Larabars. I’ve been eating them since I started going towards a more paleo friendly diet back in 2015. They are my go to treat when I crave something sweet. And their “bites” are amazing too. It’s so hard to pick one flavor that is my favorite, but being the chocaholic that I am I would say ‘chocolate chip brownie’. I love that its made with fair trade certified chocolate chips and cocoa, dates, almonds, and walnuts! The banana bread flavor contains almonds, dates and bananas. I love all of them but current favorite is cashew cookie because they are paleo! All that’s in them is cashews and dates. When I am not having a paleo bar it would be your favorite, the choco chip cookie dough! I love Larabars! I think my favorite go-to flavor is Peanut Butter Chocolate Chip. Ingredients are dates, peanuts, sea salt, and best of all, chocolate chips! My absolute favorite has the to be the Chocolate Chip Cookie Dough! It only contains Cashews, dates, chocolate chips, and sea salt, yet tastes just like real cookie dough! And happy birthday! My brothers birthday is tomorrow as well, he turns 21! I hope you have a great day with all your loved ones. My favorite is the Coconut Chocolate Chip, it only has: dates, chocolate chips, unsweetened coconut, cashews, and almonds. I absolutely love this flavor! But I saw they have a cappuccino flavor that I really want to try! I love the chocolate chip cookie dough! Cashews, Dates, chocolate chips, sea salt! I just recently started eating these and they’re amazing! My favorite is the Coconut Cream Pie, with dates, almonds, cashews, unsweetened coconut, and extra virgin coconut oil. My runner up would probably have to be Peanut Butter Chocolate Chip. I didn’t realize there was a Mint Chip flavor. I can’t wait to try this one! My favorite is the Coconut Cream Pie, with dates, unsweetened coconut, almonds, cashews, and extra virgin coconut oil. My runner up is Peanut Butter Chocolate Chip. I didn’t realize there was Mint Chip flavor. I can’t wait to try this one! I haven’t tasted a Larabar I didn’t like, but my favorite is Chocolate Chip Cookie Dough. And it only has 4 ingredients (cashews, dates, chocolate chips, and sea salt)! I love them all but my absolutely favorite is the peanut butter chocolate chip bar!! It has dates, peanuts, chocolate chips, and sea salt!! I love the Banana Bread- Just Dates, Bananas, and Almonds!! My favorite bar is the Peanut Butter Chocolate Chip bar. It has dates, peanuts, chocolate chips and sea salt! My fave flavor is also chocolate chip cookie dough! Love that it’s all simple, pronounceable ingredients.. Larabar has been one of my go to’s for YEARS. Have you tried their bites yet?? Obsessed with the chocolate macaroon bites..they have only 5 ingredients: dates, chocolate, coconut, almonds, and coconut flour. My fave is Peanut Butter Chocolate Chip–I’m a full-time working mama and these bars are THE PERFECT on the go snack! I keep them stashed in my pocketbook and diaper bag all the time! Ingredients: dates, peanuts, chocolate chips and sea salt! LOVE! Okay so I love the chocolate chip cookie dough… but my store only carries that one and the apple pie and cashew cookie. I WANT TO TRY THEM ALL! Lol but ingredients: Cashews, dates, chocolate chips, and sea salt! How can you go wrong?!?!? Cashews, dates, chocolate chips, sea salt! I love the chocolate chip cookie dough! It only has cashews, dates, chocolate chips, and sea salt! I love Larabars! I’ve had a recent obsession with them lately and have been trying to try them all! My favorite (as of now) is chocolate chip cookie dough. It has 4 ingredients: cashews, dates, chocolate chips (fair trade), and sea salt. Yum! I love the carrot cake flavor! (Carrots, dates, almonds, walnuts, raisins, pineapple, coconut, cinnamon, coconut oil) ? LOVE LOVE LOVE the Apple pie. My Favorite. Love them after a hard workout or run!! Cashew cookie! Two ingredients: dates and cashews! Love the simplicity and clean ingredients… and that so many of the products are vegan! Thanks for hosting the giveaway! My favorite is the Chocolate Chip Brownie! Ingredients: Dates, chocolate chips, almonds, walnuts, cocoa powder, and sea salt. Peanut butter chocolate chip cookie!! Four ingredients: dates, peanuts, chocolate chips, and salt. Love it! My favorite is the Mint Chip Brownie which has: dates, almonds, semisweet chocolate chips, cashews, cocoa powder, & peppermint oil. 🙂 SO good!! My favorite is the lemon bar –dates, cashews, almonds and real lemon. Awesome! I love chocolate brownie, which has dates, cocoa, chocolate chips, almonds, walnuts and salt! Pecan Pie!!! Dates, Pecans, and Almonds! YUMM!!! I love them as a sweet treat that I don’t have to feel guilty about 🙂 Or as a good pick-me-up in the middle of the day! My favorite is the Apple Pie Lara Bar! It has 6 ingredients. Almonds, Walnuts, Apples, Raisins, Dates, and Cinnamon. I love Lara Bars and their brand! My favorite original Lara Bar is the Apple Pie! In the Apple pie bar are 6 ingredients, Apples, Dates, Almonds, Raisins, Cinnamon, and Walnuts! YUM! For morning my fav is def Banana Bread! I’m constantly buying them in the largest pack I can find. They have bananas, dates, and almonds. LaraBars are awesome! I’m a big fan of the chocolate chip brownie one with Walnuts, Dates, Cocoa Powder, Chocolate Chips, Almonds and Sea Salt. My favorite is blueberry muffin with DATES, CASHEWS, UNSWEETENED BLUEBERRIES, BLUEBERRY JUICE CONCENTRATE, LEMON JUICE CONCENTRATE, VANILLA EXTRACT. So yummy after a long workout. Thanks for sponsoring this giveaway Taralynn and Larabar! I love the Peanut Butter chocolate chip flavor too! The dates, peanuts, semisweet chocolate chips, and salt are so so delicious when you freeze it for a few minutes first! It makes a wonderful dessert! I love Cherry Pie- dates, almonds, cherries! I’d have to say my favorite is the chocolate chip cookie dough. I’ve been a fan for years! I LOVE the peanut butter choc chip ❤ Dates, Peanuts, Chocolate Chips and Sea salt! The lemon bar is so good! Dates, lemon zest, nuts. Actually tastes like a lemon bar, which kinda blows my mind. My fave is the blueberry muffin bar! Love these so much! I love pecan pie with the pecans, almonds, and dates! Never tried one, but Cappucino sounds delicious!! Dates, almonds, cashews, fair trade coffee and vanilla extract. My ABSOLUTE favorite is the Banana Bread!! It has bananas, dates, and almonds. I’m in love with banana bread and this is such an amazing alternative. Plus I know they are wholesome ingredients compared to other bars. Larabars have my heart. Anything with coconut and chocolate and I’m sold. My favorite only had 5 ingredients! Crazy right?? The coconut chocolate chip bar has Dates, Semisweet chocolate chips, unsweetened coconut, cashews, and almonds! Yum! I LOVE your blog by the way. I’ve been following you for almost 7 years now. And it’s awesome seeing what you’ve gone through and what you’ve been able to accomplish. You’re amazing girl!! Cashew Cookie! Only two ingredients, cashews and dates! Love love love LARA bars. I am in nursing school and doing the whole30 currently so these are a lives aver at times. Introduced a few of my friends from school to them and we all adore them. Delicious and healthy, perfect for leading a healthy and busy lifestyle! Of the ones I’ve tried, I like blueberry muffin. I also go for the chocolatey ones sometimes. I LOVE larabars! My favorite is a seasonal flavor, snickerdoodle! I’m so bummed because I’m almost out and won’t be able to get more until next fall. The ingredients are dates, cashews, almonds, cinnamon, sea salt, and vanilla extract. Larabars are the perfect snack for me to keep at work and prevent me from snacking on all the junk food everyone always has around ? Love the cashew cookie bars! Just cashews and dates. Yum! 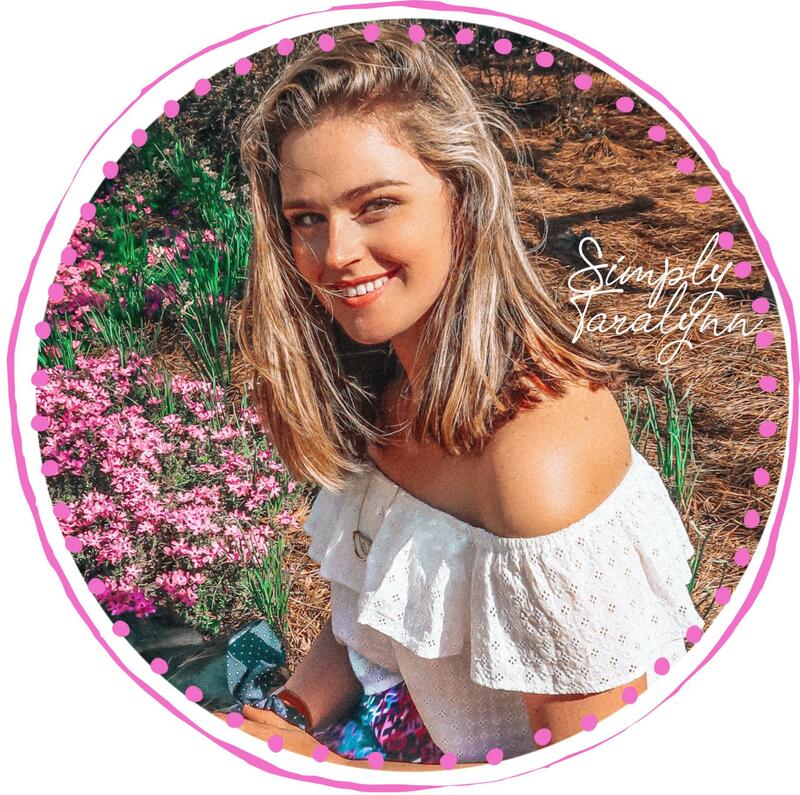 Hi Taralynn, thanks for the amazing giveaway! I’ve never tried the LÄRABAR snacks but they seem very tasty! If I had to choose one, I’d say : Chocolate chip brownie, which contains dates, chocolate chips, almonds, walnuts, cocoa powder and sea salt. Yummy! My favorite is the peanut butter chocolate chip and it only has 4 ingredients: dates, peanuts, chocolate chips, and salt. I hate to be a Debbie Downer, but these bars are not healthy at all. They are LOADED with sugar. The least amount of sugar in a bar that I could find in these was the 16 grams in the cappuccino bar. Let’s compare that to a snickers bar that has 27 grams of sugar. A chocolate flavored rice cake has 4 grams of sugar. No wonder Lara Bars taste so good! I know these are convenient and non-perishable, but I don’t know how they can get off advertising these as healthy. You can’t simply compare these to a snickers bar. The sugars in snickers come from chocolate and added refined sugar. They are WHOLE foods and you can pronounce and recognize every single ingredient in a larabar, you can’t do that in a Snickers bar. Larabars have healthy fats and food that is beneficial to our health 🙂 And if you’re working out, these sugars are great for helping your muscles with recovery. My favorite is coconut cream pie. Seriously addicted to coconut at the moment! PB Chocolate Chip – dates, peanuts, chocolate chips and sea salt! Great product, I love to eat healthy and clean and not many other bars on the market offer this! Thanks Taralynn! My FAV flavor is Carrot Cake which has dates, almonds, walnuts, raisins, dried pineapple, unsweetened coconut, carrots, cinnamon, and extra virgin coconut oil! I love carrot cake and this bar allows me all the tasty flavors but healthy! I love the Lara Bar Bites so much! Especially when I am craving something sweet but don’t want actual junk food. My favorite bar is the chocolate chip brownie which consists of dates, chocolate chips, almonds, walnuts, cocoa powder, and sea salt. I have a limited selection of these where I live and am dying to try the cappuccino one. I have never tried these before but always look at them and are tempted. I am going on a mission to find the mint brownie tomorrow! INGREDIENTS: DATES, ALMONDS, SEMISWEET CHOCOLATE CHIPS, CASHEWS, COCOA POWDER, PEPPERMINT OIL. But, let’s be honest. I spent a good 20 minutes reading the website and they all sound amazing! Ooh, this is fun! Dates, almonds, cashews, fair trade certified coffee, and vanilla extract (a.k.a. Cappuccino!). Yum! I LOVE Larabars, they’re sweet and filling at the same time as they’re quick, healthy and delicious. I have quite a few favorites but since I love both coconut and chocolate I think my ultimate favorite flavor is Chocolate Coconut Chew, which has five ingredients: dates, almonds, walnuts, unsweetened cocoa powder and unsweetened coconut! Cappuccino! Dates, almonds, fair trade coffee, vanilla and cashews. It gives that cozy cappuccino taste and great for a quick snack during my busy week! My favorite is Apple Pie!! YUM!.. ingredients: dates, almonds, unsweetened apples, cinnamon, raisins, walnuts .. the best!! My favorite kind of larbar will have to be the pecan pie because it only has 3 ingredients! :) Dates, Almonds, and pecans! so simple and so delicious. Cookie dough is the best! I love the flavor without the guilt of actual cookie dough! Chocolate Chip Cherry Torte is my jam!! Ingredients: Dates, Cashews, Chocolate Chips, Almonds, Unsweetened Cherries, and Sea Salt. My favorite would have to be the Peanut Butter and Jelly flavor bar. I love that it gives me the same satisfaction as eating a regular PB & J but as a healthier alternative. Plus, they use dates to make it, another one of my favorite guilty pleasures. My favorite would have the be the peanut butter and jelly flavor bar. I love that I get to have the same taste of a PB&J, but in a healthier way. I love that this bar is made with dates, since I am obsessed with them. My all time favorite is the plain ole’ apple pie larabar!!!!! INGREDIENTS: dates, walnuts, raisins, cinnamon, apples, and almonds. THAT’S IT!!! Chocolate Chip Brownie : dates, chocolate chips, almonds, walnuts, cocoa powder and sea salt 🙂 you MUST try it!! 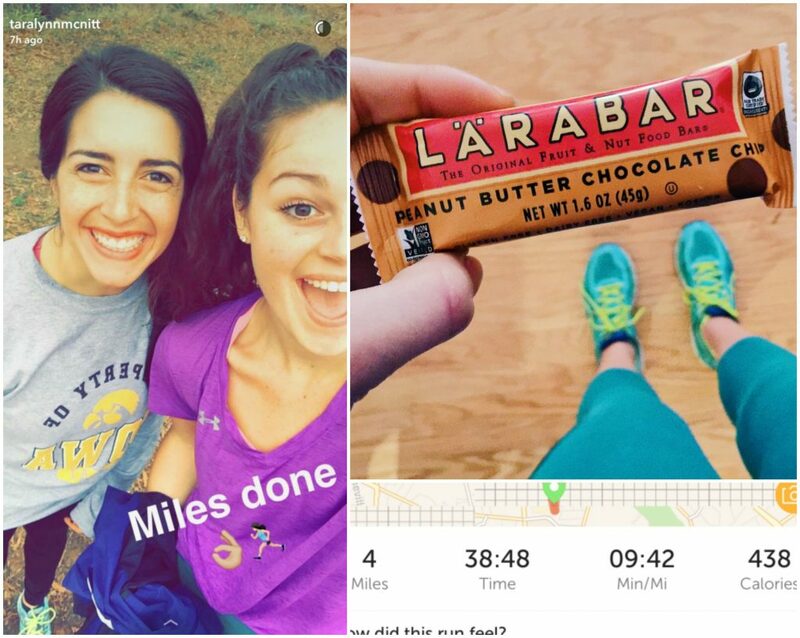 I’m also dying to try Larabar Bites–I feel like these would be great fuel for half marathon training!!!! My favorite Larabar is the Coconut Cream Pie! So darn good! It’s made of: Dates, Unsweetened Coconut, Almonds, Cashews, Extra Virgin Coconut Oil. I first found out about these bars when I completed my first Whole30 a year and a half ago. Ever since then I’ve been hooked. I’ve been living a Paleo lifestyle now and since the ingredients are so clean they’re Paleo approved too! I absolutely LOVE your blog! I’ve been reading it since 2011! You’re an inspiration! Keep on being you! The blueberry muffin bar! It has Blueberries, cashews and dates with a dash of lemon and vanilla. My favorite is the apple pie flavor! Dates, almonds, apples, walnuts, cinnamon, and raisins. Yum! I’m going to have to find the Carrot Cake and Chocolate Chip Cookie Dough soon because they both sound delicious. I am with you! Chocolate Chip Cookie Dough is my absolute fave for chocolate cravings instead of cookies! Love that there are only a few ingredients! Dates, cashews, chocolate chips, and sea salt! 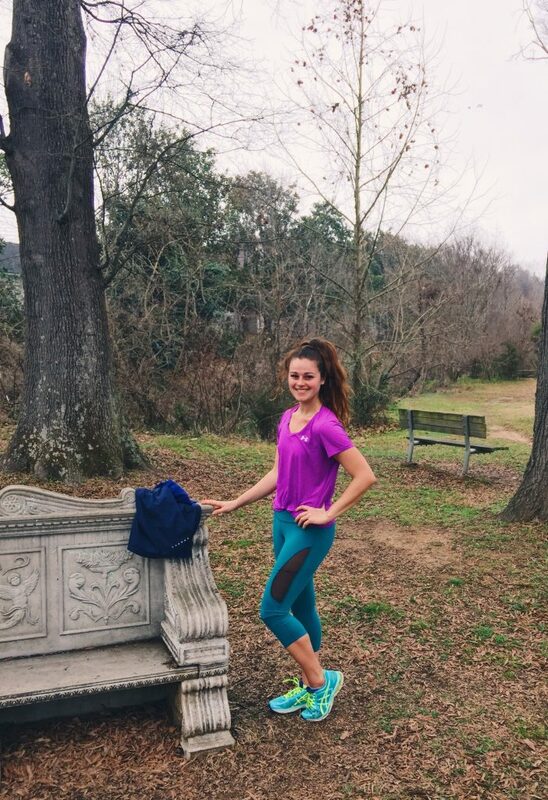 Keep up the great work in your marathon training! So inspiring! Apple pie is my favorite! Dates, almonds, unsweetened apples, walnuts, raisins, and cinnamon. Perfect treat! My favorite bar is the chocolate chip cookie dough bar with the ingredients of cashews, dates, chocolate chips, and sea salt! I’m dying to try the blueberry muffin, pumpkin pie and cappuccino bars! 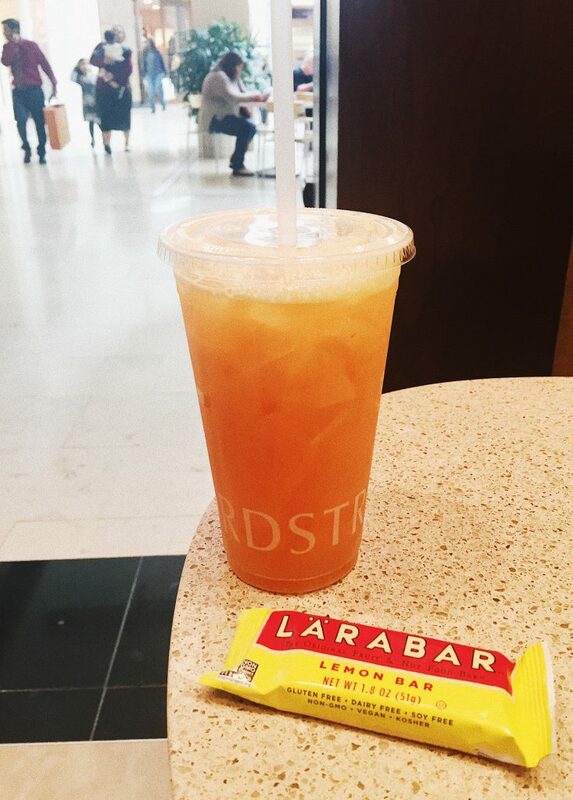 Love the carrot cake Larabar, dying to try lemon bar! I’ve been known to carry a stack for long car rides and hikes! my favorite flavor is apple pie!! spiced with cinnamon and raisins, Apple Pie also has almonds and walnuts for a nutty finish. i love the coconut cream with DATES, UNSWEETENED COCONUT, ALMONDS, CASHEWS, EXTRA VIRGIN COCONUT OIL . thats some amazing stuff for a cocnut lover. I can’t wait to try the Chocolate Chip Cookie Dough– I know it’s my next favorite. Ingredients: Cashews, Dates, Chocolate Chips, Sea Salt. My favorite flavor is peanut butter chocolate chip! Ingredients are: dates, peanuts, chocolate chips, sea salt. It’s too hard to pick just one favorite! I think I might like the peanut butter chocolate chip just a little more than the rest! I love that it only has 4 ingredients. I just looked at the website and there are so many flavors I haven’t tried. There aren’t that many flavors that are sold in my town. I would love to try more! I also like having these either before a run or after! They are the perfect snack! Great post Taralynn!!! <3 <3 The Peanut butter chocolate chip one looks super good!! INGREDIENTS: Dates, peanuts, chocolate chips, and sea salt in it!!! YUMMY!!! I've never tried them before but it looks like I'm missing out!! My fav is carrot cake which is made with carrots, dates, almonds, walnuts, raisins, pineapple and coconut. You really need to try it! I definitely want to try the coconut one now. Hard to pick a favorite, but peanut butter cookie always hits the spot! Hard to believe that there’s only dates, peanuts & sea salt in the bar! I like the chocolate chip brownie which has – dates, chocolate chips, almonds, walnuts, cocoa powder and sea salt! yum! Definite fav is peanut butter chocolate chip! Ingredients are: dates, peanuts, chocolate chips, sea salt. I love the Peanut Butter Chocolate Chip but there are so many flavors I still need to try. The ingredients in PB Choco Chip are peanuts, chocolate chips, dates, and sea salt. The Mint Chip Brownie is amazing! I love mint and chocolate, so it’s the perfect fix. The best part about these bars are the ingredients: Dates, Almonds, Semisweet Chocolate Chips, Cashews, Cocoa Powder, Peppermint Oil. YUMMY!! I love chocolate chip cookie dough with just cashews, dates, chocolate chips, and sea salt! Great snack before or after class! I thought it was so funny when you said you love the chocolate chip cookie dough for dessert; that’s exactly what I do! Its the perfect snack to curb my nighttime sweet tooth and I love knowing that I’m not filling my body with highly processed fake ingredients. I never thought of putting them in the freezer or dipping in my coffee, can’t wait to try! I really like the cashew cookie. It only contains dates and cashews! My favorite flavor would be the Chocolate Chip Brownie. The ingredients are Fair Trade Certified™ chocolate chips and cocoa, dates, almonds, walnuts and 4 grams of fiber. I love Peanut Butter Chocolate chip! My favorite flavor is Chocolate Chip Brownie! It contains chocolate chips, cocoa, dates, almonds, walnuts, and sea salt. I love the pumpkin pie one! I really want to try carrot cake, but pumpkin pie has won my heart? It contains •Dates •Cashews •Almonds •Dried Pumpkin •Cinnamon •Ginger •Allspice •Nutmeg. That’s it! Soooo yummy and such a cozy flavor for my favorite season; Fall??? I love Larabars! My absolutely favorite is Apple Pie! Ingredients are DATES, ALMONDS, UNSWEETENED APPLES, WALNUTS, RAISINS, CINNAMON!! I really like chocolate but I love the pecan pie flavor! Dates, Pecans & Almonds are the only ingredients! I love chocolate so my favorite is the chocolate chip brownie!! Only 6 ingredients: Dates, Chocolate Chips, Almonds, Walnuts, Cocoa Powder and Sea Salt. I love Lara Bars – one of my go to’s over the years has been the Peanut Butter Cookie – Dates, Peanuts and Sea Salt. I love Larabars! I’m so glad they are gluten-free and that there is such a variety of flavors. It makes gf snacking much easier. I’m a hairstylist and sometimes I only have 5 minutes to eat something in the middle of a busy day, and a Larabar perfect. I enjoy them in the morning with coffee as well! My favorite is the chocolate coconut chew with dates, almonds, walnuts, unsweetened cocoa and coconut. It’s so good with coffee and almond milk! I love LARABARS! My favorite is also chocolate chip cookie dough, and the ingredients are chocolate chips, sea salt, cashews and dates. SO GOOD! My favorite is the Chocolate Peanut butter. I can’t believe something so tasty only has 4 ingredients! Ingredients: Dates, Peanuts, Chocolate chips, sea salt. Good choice on the chocolate chip cookie dough! They are definitely my favorite as well! I craved them constantly when I was pregnant! I was also sick when pregnant, and they were about the only thing I could keep down!!! Definitely a life saver! Ingredients: Cashews, Dates, Chocolate Chips, and Sea Salt! My favorite “classic” is the peanut butter cookie which has just dates, peanuts and sea salt. But my new favorite is the banana chocolate chip! I can’t find it on the website but I can find on the shelves at Target and I ♥ it! 😀 Larabars are life savers!!! My All time FAV Larabar is the Coconut Chocolate Chip bar~~ It’s like a chocolate covered coconut macaroon! Made with Dates, Semi Sweet Chocolate Chips , Unsweetened Coconut, Cashews and Almonds… Its the Perfect healthy dessert, and also a great pick me up after workouts!!!! I love a few different flavors, but my absolute favorite is the chocolate chip cookie dough! I love that it only has four ingredients: cashews, dates, chocolate chips & sea salt!! I really want to try the banana bread!! I like to keep it simple, so my favorite is PB&J– just dates, peanuts, cherries and a dash of salt! My favorite is the Blueberry Muffin: dates, cashews, unsweetened blueberries, blueberry concentrate, vanilla extract and lemon juice. Yum!! I also love the chocolate chip cookie dough flavor! It’s my go to “hangry” snack when I’m out and about. The fruits and greens Larabar on the website look fantastic too. I haven’t tried them yet, but the mango spinach cashew flavor includes all of my favorite fruits! This is an awesome give away! I absolutely love these bars, I haven’t been able to try them all yet, but my favorite is the Pumpkin Pie! The ingredients are DATES, CASHEWS, ALMONDS, DRIED PUMPKIN, CINNAMON, GINGER, NUTMEG, ALLSPICE. Its amazing it has minimal ingredients but is packed with so much flavor! Also after looking on their website I had no idea that they had a cappuccino flavor or even a mint chocolate brownie!! Hoping to find these flavors soon because they sound amazing!!! I really like most of them, but my fave is the cashew cookie. It’s just cashews & dates. That’s it! Most of their bars have saved me while doing Whole30. Yum! My favorite is the peanut butter! Peanuts, dates, and sea salt! I love the peanut butter chocolate chip! Dates, peanuts, chocolate chips and sea salt. My long time favorite has been the Pecan Pie jus Dates, Pecans, and Almonds. I always keep a couple flavors in my backpack to keep me going! My absolute favorite is the peanut butter cookie Larabar! Just dates, peanuts and sea salt! This giveaway is amazing!!!! I actually have a Larabar in my purse right now to eat after work/before my afternoon workout. My favorite flavor is key lime pie: dates, cashews, almonds, unsweetened coconut, lime juice concentrate, and dried lime juice concentrate. I have never had a Larabar so these all look amazing! I can’t wait to try some of these flavors! The Coconut Chocolate Chip sounds delicious and has only 5 ingredients of dates, semisweet chocolate chips, unsweetened coconut, cashews and almonds. I just started training for a half marathon as well and have been looking for a good pre/post workout snack so I am excited to get some of these!! My favorite has to be chocolate chip cookie dough- such a classic! Cashew, date, salt, and chocolate chips are the best. I still need to try the coconut cream pie though. That one sounds amazing! I’ve never had a Larabar, but now I want to try one!! Question though, do you think having three in one day might be too much sugar? Its all about when you have them! I had one before and after a run, when my body needed that natural sugar for energy and recovery! Having three in one day on a casual relaxed day may be too much for some people, but when it comes from a natural source, I don’t worry about it too much. Whoah!! That’s a lot of comments…haha! I really enjoy the Cappuccino flavor: coffee, almond, dates almonds, vanilla extract! DELISH and it tastes like an afternoon pick me up. Can’t wait for your next blog post! What a great giveaway! I love Larabars! My favorite is probably the Blueberry bar with dates, cashews, unsweetened blueberries, blueberry juice concentrate, lemon juice concentrate, and vanilla extract. Yay! I can’t wait to try more Larabars, I’ve only had one! (blueberry, so good!) But I think if I tried them all my favorite would probably be the peanut butter cookie which just has peanuts, dates, and sea salt! Love your blog Taralynn! My Favorite is Chocolate Chip Cookie Dough! (Cashews, dates, chocolate chips, and sea salt)! Oh yum! Coconut cream pie: Dates, Unsweetened Coconut, almonds, Cashews, Extra Virgin Coconut Oil. Larabars have been a lifesaver throughout my pregnancy!! I’m 5 months now 🙂 current favorite is banana bread: dates, almonds, unsweetened bananas. Yum! Ok nobody seems to pick this one, but cashew cookie!! That’s my absolute favorite, I actually crave it! I also just found out that it only has two ingredients, cashews and dates! How I never realized that I will never know. Dates, peanuts, chocolate chips and sea salt equals a delicious sounding treat! I want to try Peanut Butter Chocolate Chip!!! I will be stopping at store to find that flavor tomorrow!! I have not tried this brand before, but love how it fits into a healthy lifestyle! I pretty much love any larabar with chocolate but Mint Chip Brownie is always a tasty choice. INGREDIENTS: DATES, ALMONDS, SEMISWEET CHOCOLATE CHIPS, CASHEWS, COCOA POWDER, PEPPERMINT OIL. I wish they still sold the Pineapple Coconut one, it was by far the best flavor! I love Cashew Cookie because I looooove cashews! This only only has dates and cashews. It’s so bomb. Probably banana bread, blueberry muffin, pb&j, or cashew cookie. Honestly, I cannot choose. I read on your blog a long time ago about Larabars and they stuck with me but I wasn’t in the healthiest of places at that time. Later on I remembered them when I was wanting something super quick that was sweet, yet I didn’t have to make a whole batch of (which I would definitely eat all of) and they popped back into my mind. Every since then I buy a box every week. Sometimes I have a whole bar, sometimes I split one between two days but I love that they’re sweet yet only full of real ingredients and I never have to feel guilty about eating them. Chocolate Chip Cookie Dough is my favorite too! I know by heart what they have in it (Dates, Cashews, Chocolate Chips & Sea Salt) because with only 4 ingredients, it’s easy to remember! We only have 3 flavors available near us, my favorite (so far), peanut butter and cashew cookie. This fall I got to try the apple pie and was super excited. I’d love to be able to try more flavors. Chocolate chip cookie dough or lemon for sure! My favorite is Peanut Butter cookie: peanuts, dates, & sea salt! I’m dying to try the Mint Chip Brownie though!! YUM! LOVE the snickerdoodle larabar but I normally only see them in the fall for seasonal! My go to is the Peanut Butter Chocolate Chip! I also like the peanut butter and Jelly but can never find it. I have to be honest I have never tried a LARABAR, however this post came at the perfect time because I’ve been looking for a healthy snack to take with me to my classes, that are small and easy to store, so thank you! The one that I definitely want to try first is the Peanut Butter Chocolate Chip! 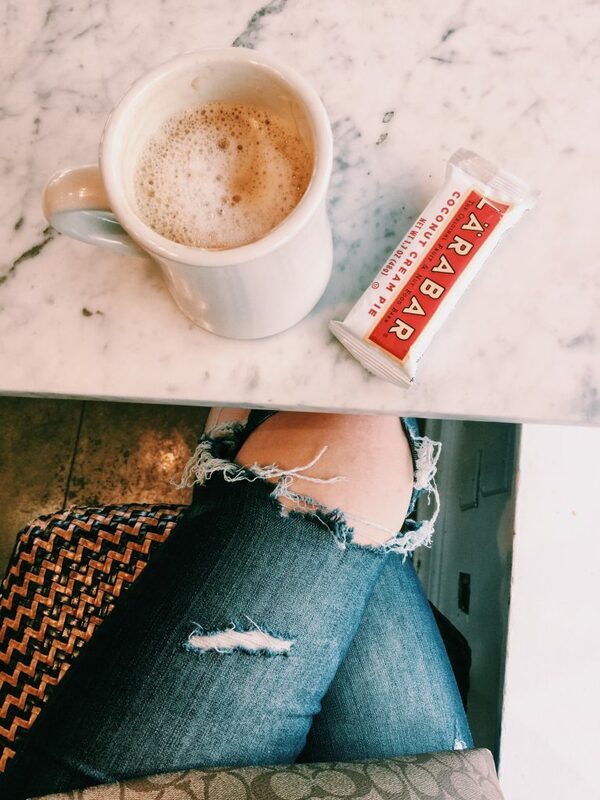 I have a little bit of a sweet tooth, so this bar would be the perfect alternative to the late night chocolate cravings! The ingredients are dates, peanuts, chocolate chips, and sea salt! WHAT?! That’s it? That’s awesome! I love banana bread: dates, almonds and banana! Noms in the toms. I have loved all the Larabar flavors I’ve tried so far. But I’m very excited to try the Snickerdoodle flavor! I love the cashew cookie flavor! The only ingredients are cashews and dates, which makes it even better! I can’t believe something with only two ingredients can taste this delicious! My favorite is the Chocolate Chip Cookie Dough – only dates, cashews, chocolate chips and sea salt! Perfect for a quick fix for the sweet tooth craving! Snickerdoodle is amazing! It has dates, cashews, almonds, cinnamon, sea salt, and vanilla extract. Chocolate chip cookie dough is a close second! I am obsessed with LARABAR! My favorite is the Chocolate Chip Cookie Dough with cashews, dates, chocolate chips and sea salt. They truly are a LIFESTYLE bar like Taralynn said – always perfect for any occasion! Cherry Pie-cherries, dates, and almonds. The best! Chocolate pb for sure! Dates, peanuts chocolate chips and sea salt! Yummy! My favorite is the mint chip brownie, which has dates, almonds, semi-sweet chocolate chips, cashews, cocoa powder, peppermint oil. I love that their bars are vegan friendly! Happy early birthday!! Mine is the 27th! I like Banana bread : bananas, dates, and almonds. My favorite is blueberry muffin. Love the dates, cashews, unsweetened blueberries, blueberry juice concentrate, lemon juice concentrate, and vanilla extract. Yum! The chocolate chip cookie dough is by FAR the BEST!!! I love how it only has cashews, dates, chocolate chips and sea salt. It’s perfection. Thanks for doing a giveaway!!! I LOVE the apple pie and coconut cream pie flavors! They really are for every lifestyle! When I do Whole30 resets they are even compliant! So hard to pick just one but I’d have to go with Cashew Cookie, it was the first Larabar I ever tired and I always go back to it! Hard to believe there are only two ingredients: cashews and dates!! I’ve never tried a Larabar, but think the Chocolate Chip Cookie Dough sounds amazing! The ingredients are: Cashews, Dates, Chocolate Chips and Sea Salt! Yay! I LOVE the coconut chocolate chip–dates, semisweet chocolate chips, unsweetened coconut, cashews, and almonds –they’re the perfect treat for a sweet tooth. HOWEVER, my absolute favorite is the blueberry muffin–dates, cashews, unsweetened blueberries, blueberry juice concentrate, lemon juice concentrate, and vanilla extract. The creator of Larabar was my graduation speaker in college; she is SUCH an inspiring woman. Not only are the bars delicious, but the company has such awesome motives of creating affordable, genuinely healthy snacks for EVERYONE. I just love them. Just cashews and dates! I have only tried a few but I can’t wait to try many more!! This giveaway is awesome! Chocolate chip cookie dough 🙂 dates, sea salt, chocolate chips, and cashews, delicious! Peanut Butter + Jelly is a life changer!! So so so good. I have one weekly 🙂 Also, their new SuperFood ones are delish and include greens! 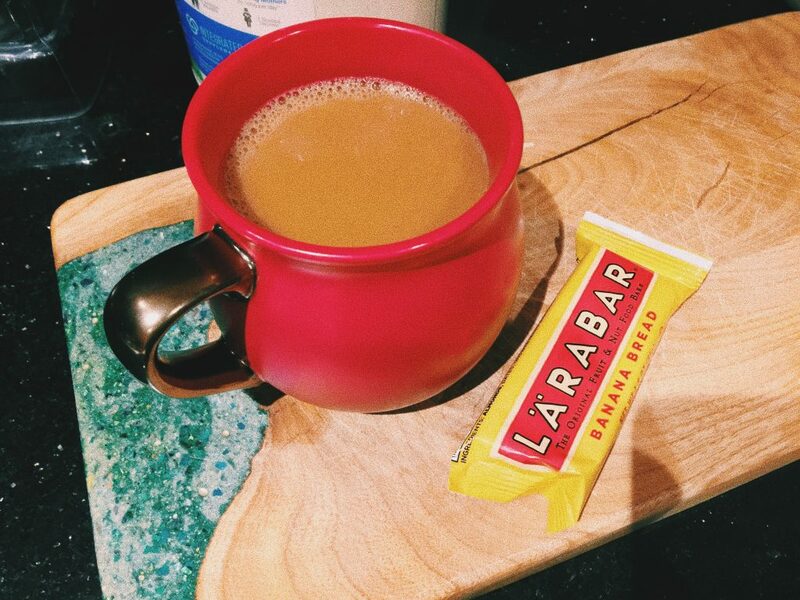 Larabars are the perfect preworkout snack! My favorite is chocolate chip brownie contains: dates, chocolate chips, walnuts, almonds, cocoa powder and sea salt! ? 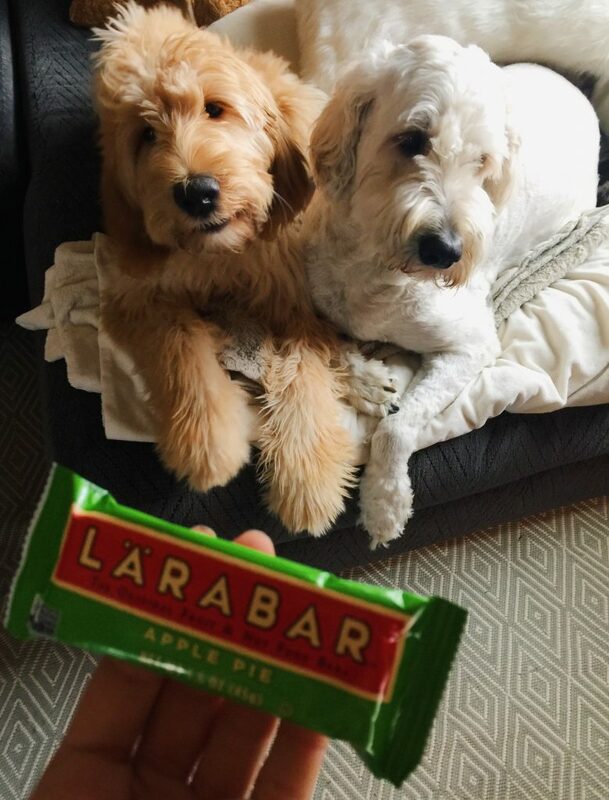 My favorite is the Coconut Chocolate Chip-I LOVE Larabars! Thank you for doing this giveaway! I love larabars. My favorite is mint chip brownie (only 6 ingredients! ): Dates, almonds, Semisweet Chocolate chips, Cashews, Cocoa powder, Peppermint Oil. So delicious! My favorite L’A’RABAR is the Chocolate Chip Cookie Dough which has ingredients of Cashews, Dates, Chocolate Chips, and Sea Salt. SOOO YUMMY! Choc Chip Cookie Dough! Cashews, dates, choc chips & salt! Lemon Bar! Dates, Cashews, Almonds, Lemon juice concentrate, Dried lemon juice concentrate, and lemon oil! Peanut butter anything! Peanut butter cookie is my current favorite but I was unaware they have SO MANY flavors! I will have to start branching out! Id definitely have to say that I am a peanut butter fein and the peanut butter cookie is my favorite. Especially because it only has the peanuts, dates, and sea salt as the ingredients! so simple but so delicious. I LOVE the cherry pie. Dates, cherries and almonds. Thanks so much for the giveaway. My favorite is cherry pie and I love that it only has 3 ingredients! Unsweetened cherries, dates and almonds. My favorite bar would have to be Coconut Cream Pie, it tastes like eating an Almond Joy 🙂 Dates, Unsweetened Coconut, Almonds, Cashews, and Extra Virgin Coconut Oil. The Pumpkin Pie is my all time favorite! Pumpkin + Cinnamon + Cashews are three of my favorite things! Not to mention the Ginger, Almond, Nutmeg, Allspice and Dates. It’s so great to know exactly what you’re eating! Plus that new water bottle would be amazing, my husband melted my favorite one by leaving it next to the stove. First off, I became a reader of your blog when you went on the Stitch Fix Trip and just want to say I really enjoy your posts. Honestly, I haven’t tried many Lara Bars, but I love anything with peanut butter or coconut. The coconut chocolate chip bar with dates, cashews, almonds, chocolate chips and cocnut sounds like it would definitely be a fvaorite for me. My ultimate favorite was the Mocha Chip – which was limited edition. The only other one to live up to the standard (that I’ve tried) is the snickerdoodle. Ingredients: dates, almonds, cashews, cinnamon, sea salt, vanilla. Obsessed with Cappuccino (the coffee love goes deep and beyond just cups of it) – dates, almonds, cashews, coffee, vanilla extract. Delish!!! First off I became a reader of yours around the time you went on the Stitch Fix trip and I really enjoy your posts! Honestly, I’ve only tried a couple of the Larabar flavors so it would be awesome to try more! I am a fan of anything with peanut butter or coconut, but the coconut chocolate chip bar with dates, chocolate chips, coconut, cashews and almonds sounds like it would definitely be a favorite of mine! I have never had a Larabar but after seeing that there’s only three ingredients (pecans, dates and almonds) in the Pecan Pie Larabar,I think I will be stopping on my way home to pick some up! Didn’t realize that Larabars had only a few ingredients. I love that! The chocolate chip brownie would be my fave with only chocolate chips and cocoa, dates, almonds, walnuts ? Ingredients: Cashews, dates, chocolate chips, and sea salt. It’s ingredients are: Cashews and dates. That’s it! I can’t believe it! Yummmm. Chocolate Chip Cookie Dough: Cashews, Dates, Chocolate Chips, and Sea Salt! This giveaway is everything! My favorite flavor is Coconut Cream Pie: dates, unsweetened coconut, almonds, cashews, and extra virgin coconut oil! Love this! Dates, Unsweetened Coconut, almonds, Cashews, Extra Virgin Coconut Oil. (Coconut creme pie.) The only hard part about Larabars is picking your fave. 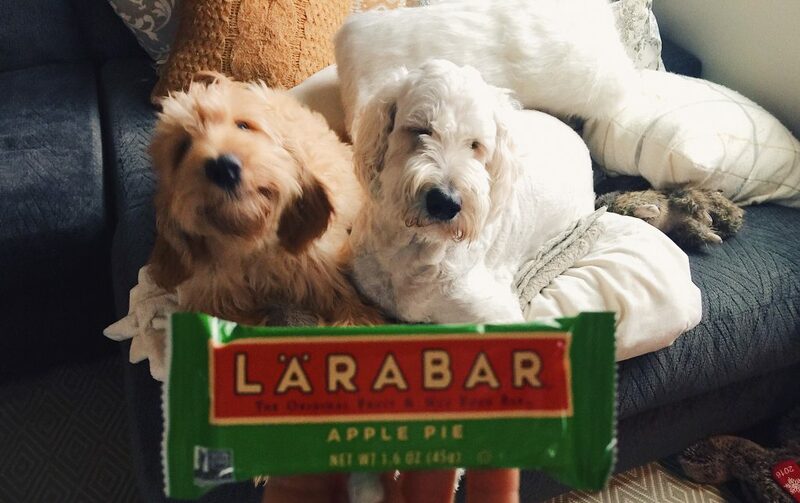 Favorite flavor of LaraBar would have to be Mango Spinach Cashew – the only ingredients are: mango, spinach, cashews, unsweetened apples & apricots. I will definitely be making a LaraBar shopping trip this week! Craving one right now! My favorite is Banana bread : bananas, dates, and almonds. Happy early birthday! I’m trying to get back into a healthier lifestyle and these bars are definitely helping me keep on track with my goals. I love the Chocolate Chip Brownie bar (dates, chocolate chips, almonds, walnuts, cocoa, and sea salt). Also happy early birthday!! Peanut butter cookie is my favorite flavor! I love your blog especially as I will be a future Charlotte resident! Keep up the awesome work! Love peanut butter anything – so peanut butter cookie is the one for me! That’s all! Kind of amazing! I love all things PB – so the peanut butter cookie is the one for me! Only three ingredients, peanuts, dates and sea salt – CRAZY! Can’t wait to try these incredible bars! My favorite flavor is the Lemon Bar! Only six ingredients: dates, cashews, almonds, lemon oil, lemon juice concentrate, and dried lemon juice concentrate. I always keep a Lara Bar in my work bag, my car, and my work out bag! I have a huge sweet tooth (especially at night) and as someone who is trying to lose weight and get healthy, these are a lifesaver sometimes when I just can’t resist something sweet!!! Favorite flavor (so far) is Coconut Chocolate Chip. Ingredients: dates, semisweet chocolate chips, unsweetened coconut, cashews, and almonds. I’ve literally loved every Larabar I’ve tried, and they were such a lifesaver when I was doing Whole30. I think my “official favorite” might be Blueberry Muffin (blueberries, cashews and dates with a dash of lemon and vanilla). I do find the combination of ingredients definitely keeps me fuller longer than a regular granola bar. Chocolate Chip Cookie Dough is my favorite variety that is available year-round (made with cashews, dates, chocolate chips, and sea salt). Snickerdoodle is my all-time favorite though! I have to cast my vote for the snickerdoodle one. It has dates, almonds, cashews, sea salt, cinnamon, and vanilla extract. Although the gingerbread flavor mentioned by Alex sounds amazing as well – will have to keep my eyes peeled for it. Lemon bar is definitely my favorite 🙂 I love all of the fruity bars especially! The ingredients of dates, cashews, almonds, and lemon flavors in this one make it so amazing! Chocolate chocolate chip or chocolate coconut are my favorites! I keep a larabar on me at all times. In every purse I have, all my bags, my car, my desk drawer. The blueberry muffin is my favorite, but I love them all! I’m new to Larabar so I’ve only tried a couple. I absolutely LOVED the pecan pie 🙂 Oh my goodness it was delicious. I can’t wait to try the lemon and key lime pie bars. Those are two of my favorite desserts so hopefully they can become a substitute for when I have late night cravings! I’ve been in love with the Cherry Pie flavor for years! Who doesn’t love something as simple as dates, almonds, and unsweetened cherries?! So hard to pick just one flavor – I love them all! Right now I’m eating lots of Apple Pie bars – INGREDIENTS: DATES, ALMONDS, UNSWEETENED APPLES, WALNUTS, RAISINS, CINNAMON. 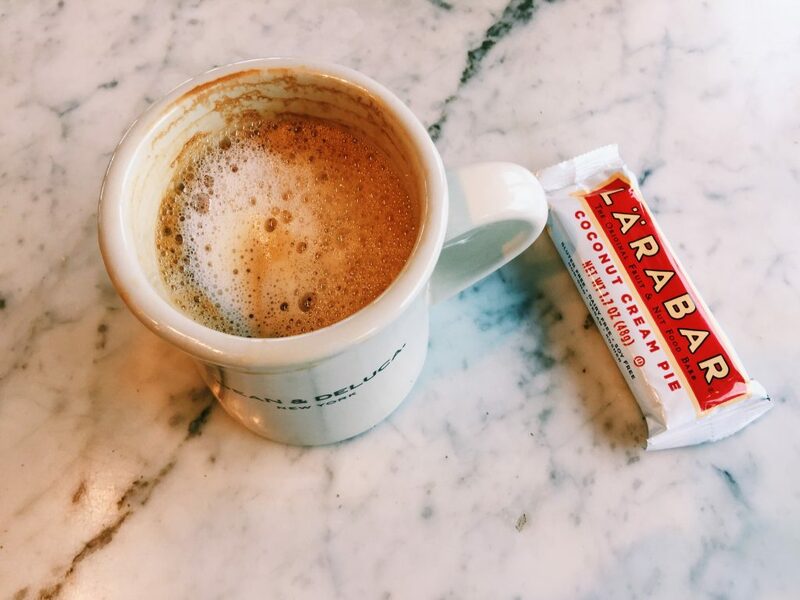 As a first-time pregnant mom on-the-go, Larabars are one of the few packaged snacks I’ve found that I feel comfortable feeding my growing little one. My favorite is the Blueberry Bar (blueberries, cashews and dates with a dash of lemon and vanilla). And Happy Early Birthday to you! Pecan pie is my favorite! Dates, pecans and almonds…yum! “Perfect for your hangry friends” baahaha so true. I’ve only tried a couple Larabars, but my favorite one so far has been Cherry Pie! It has dates, almonds, and unsweetened cherries. I want to try the chocolate chip cookie dough and the brownie one soon. My favorite flavor is Cappuccino! It has dates, almonds, cashews, fair trade coffee and vanilla extract. Hands down it would be the peanut butter chocolate chip!!!! My favorite flavor has to also be the Chocolate Chip Cookie Dough! Made just with cashews, dates, chocolate chips, and salt. Amazing. I swear they must know magic over there to make them so good with just 4 ingredients! My favorite, like yours, is the chocolate chip cookie dough with cashews, dates, chocolate chips, and sea salt! I love them al but my CURRENT fav is Coconut Chocolate Chip! Only 5 ingredients: dates, semisweet chocolate chips, unsweetened coconut, cashews and almonds – amazing!! I love LARABARS. It was so hard to choose my favorite flavor, but Cherry Chocolate Chip Torte took the cake- Dates, chocolate chips, almonds, cherries, cashews and salt! So perfect! My favorite is Cherry Chocolate Chip Torte which has: Dates, chocolate chips, almonds, cherries, cashews, and salt! I’ve recommended these to all my friends who are starting out on their healthy lifestyle journey! Love these to the end of time…especially the PEANUT BUTTER CHOCOLATE CHIP! Holy yum! Only DATES, PEANUTS, CHOCOLATE CHIPS, and SEA SALT! does it get any better…?? Blueberry muffin is my fav! Dates, cashews, unsweetened blueberries, blueberry juice concentrate, lemon juice concentrate, and vanilla extract. My favorite Lara Bar is the Chocolate Chip Peanut Butter!! It’s made with Dates, Peanuts, Sea Salt, and Chocolate Chips!! So good!! Ingredients: DATES, CHOCOLATE CHIPS, SEA SALT, and PEANUT BUTTER! I love all of THE Lara Bar flavors and am a huge fan of the company!! Chocolate chip cherry torte! Dates, chocolate chips, almonds, unsweetened cherries, cashews, and sea salt! But I also really love the chocolate chip cookie dough and want to try the chocolate chip brownie and cappuccino. I love Larabars! My favorite is chocolate chip cherry torte which has dates, chocolate chips, almonds, unsweetened cherries, cashews & sea salt. My all time favorite is Sticky Bun, but it doesn’t seem like they make that flavor anymore. Now it is Blueberry Muffin: six ingredients: dates, cashews, unsweetened blueberries, blueberry juice concentrate, lemon juice concentrate, vanilla extract. Cashew Cookie is always my #1 pick! Just cashews and dates. The chocolate chip cookie dough is my favorite too! The ingredients are cashews, dates, chocolate chips, and sea salt! I love Larabars! I still have so many flavors to try though! My current favorite is Apple Pie! It has dates, almonds, unsweetened apples, walnuts, cinnamon, and raisins. So good! Peanut butter! Peanuts, dates, salt! My favorite is peanut butter! I love Lara bars: peanuts, dates, sea salt! That’s all! The Lemon Bar! With dates, cashews, almonds, lemon juice concentrate, dried lemon juice concentrate, and lemon oil! I love lara bars. I also eat half before a run and half after!!!! They work so well for running fuel and my stomach is pretty sensitive. I would have to say my favorite flavor is chocolate coconut chew. The ingredients are: DATES, ALMONDS, WALNUTS, UNSWEETENED COCOA POWDER, UNSWEETENED COCONUT. I haven’t tried banana bread yet but I’m guessing that may be my new favorite 🙂 and you’ll never believe buy my birthday is also January 31!! I’ve never had one of these bars before. Love anything peanut butter. The peanut butter bar has peanuts dates and seasalt…Crazy! Can’t wait to give it a try! Chocolate chip cookie dough bars save me from an afternoon candy break when my energy dips. So,delicious with chocolate chips cashews dates and sea salt. Nom nom nom!!!!! Love anything peanut butter. The peanut butter bar has peanuts dates and seasalt…Crazy! Can’t wait to give it a try! My fav is the chocolate chip cookie dough with cashew, dates, chocolate chip, and sea salt! Larabars are seriously the best! The Peanut Butter Chocolate Chip is my favorite flavor! Ingredients: dates, peanuts, chocolate chips, and sea salt. There are so many flavors I have yet to try (especially the coconut chocolate chip and cappuccino)! The apple pie bars are my FAVORITE! I ate them all the time when I was pregnant last year- I always had them in hand when I got hungry and since they were so natural, I felt great about eating them!! The apple pie bars have dates, apples (of course! ), almonds, walnuts, raisins, and cinnamon! Chocolate Brownie is my fav!!! ? I’ve been falling your blog for years. Dates, chocolate chips, almonds, walnuts, cocoa powder, and sea salt! This is tough, but I would say my favorite is Cherry Pie! Dates, almonds, and unsweetened cherries! I like the Blueberry muffin bar with dates, cashews, blueberries, blueberry juice, lemon and vanilla. I love the blueberry one! Dates, cashews, blueberries, lemon, and vanilla extract. So delicious! Chocolate chip brownie…. DATES, CHOCOLATE CHIPS, ALMONDS, WALNUTS, COCOA POWDER, SEA SALT. Peanut butter cookie is my favorite!! Ingredients: Dates, peanuts & sea salt. I’ve never seen the Snickerdoodle bar in store, but now that I seen it on the website I’ll have to search for it! I love cashew cookie (just dates and cashews?!?!) but there are flavors I have never even seen! Can’t wait to try them all. When I’m craving something sweet, I make Larabar cookies from the Chocolate Chip Brownie bar. I divide the bar into 4 pieces, put them in the microwave for 2 minutes, and they’re the perfect replica of brownie bites! The four ingredients of just chocolate chips and cocoa, almonds, dates, and walnuts, I satisfy my craving as well as nourishing my body with essential nutrients! However, I would LOVE to try the Chocolate Chip Cherry Torte and try out the same cookies as well! I love cherries and I think this would be the perfect treat. Sea salt, cashews, cherries, dates, chocolate chips, and almonds are the ingredients that appeal to me the most- because they’re all REAL and I can pronounce them! I am absolutely in obsessed with the coconut, kale, and cacao superfood Larabar! Their 6 raw ingredient and nutrient packed bar always satisfies my late night chocolate cravings and leaves me feeling completely guilt free! It is simply the perfect “cheat” snack without trailing off my healthy lifestyle. Love love love the chocolate chip cookie dough and apple pie! The banana bread and gingerbread flavors sound super good too! I definitely need to try those ones out! Apple pie is my favorite! It keeps me going between classes and during late nights of studying! Ingredients are unsweetened apples, walnuts, dates, almonds, raisins and cinnamon. Yum! I love the gingerbread flavor. I love gingerbread flavored anything and this is the perfect way to extend the holiday taste! LOVE peanut butter chocolate chip. It has dates, peanuts, choc chips and sea salt. 4 ingredients! My favorite is the chocolate chip cherry torte! It has dates, chocolate chips, almonds, cherries, cashews, & sea salt. This blog post was made for me!!! I feel like your channeling my inner Larabar addict. I was introduced to Larabars when I did Whole30 and they were a LIFESAVER!!!! Since then I have not been able to get rid of them 🙂 Like you my favorite is Chocolate Chip Cookie Dough. It tastes amazing and satisfies my sweet tooth and I know I’m still being healthy!!! I’ve never tried this flavor before but the CHOCOLATE CHIP CHERRY TORTE looks delish! I love chocolate & fruit everything. Ingredients: DATES, CHOCOLATE CHIPS, ALMONDS, UNSWEETENED CHERRIES, CASHEWS, SEA SALT. Banana Bread!!! So GOOD… Dates, almonds and………BANANAS! Who doesn’t like banana bread? YASSSSSS! Banana Bread! Almonds, Dates, Banana! My 3 year old loves it too! I love the blueberry muffin! Just DATES, CASHEWS, UNSWEETENED BLUEBERRIES, BLUEBERRY JUICE CONCENTRATE, LEMON JUICE CONCENTRATE, and VANILLA EXTRACT! Fruit + greens: strawberry, spinach, Kale. Coconut chocolate chip or don’t bother!! The ingredients are: dates, semisweet chocolate chips, unsweetened coconut, cashews, and almonds! I LOVE anything lemon! This lemon bar is to die for with just dates, cashews, almonds, lemon juice concentrate, dried lemon juice concentrate and lemon oil??? 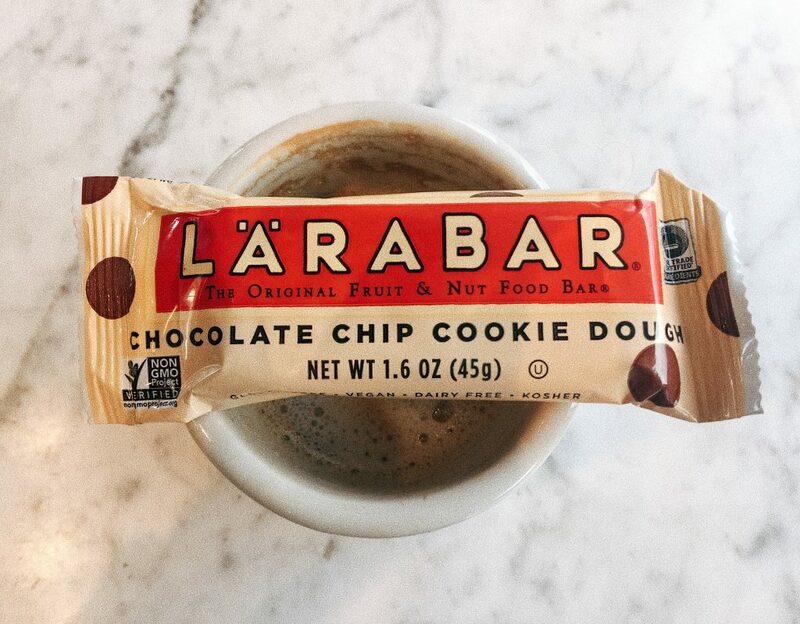 Larabars are my favorite and chocolate chip cookie dough is my favorite flavor also! cashews, dates, chocolate chips, and sea salt! I always stock up when they are on sale and I love that I can usually print coupons too! I keep them in my desk and always take them on weekend errands. I would love to try more flavors and everything you have in your giveaway is so cute! I live for the chocolate chip cookie dough one. It feels like you’re eating a dessert without the added sugar and oversized bowl of ice cream. It’s only cashews, dates, chocolate chips, and sea salt- no clue how they make them taste SO good. 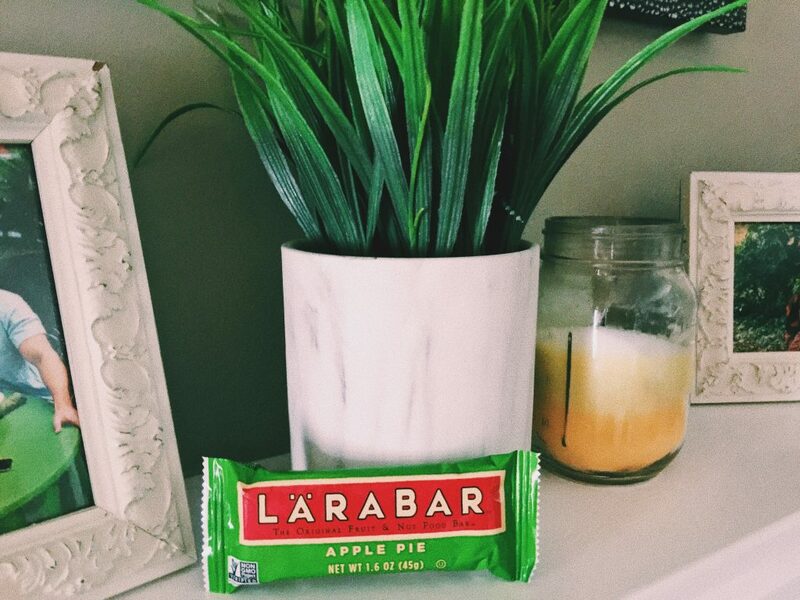 laraBars get me through- I toss them in my bag and they help me get through commutes home, busy work days where I don’t get a chance to sit and eat lunch (today), morning hikes and to get my sweet tooth. I started adding Lara bars into my routine when I really opted to cut out a lot of processed foods and watch the added sugars. It’s so hard to find a bar on the go that isn’t filled with extra stuff. I love them! Love Lara bars!!! Cashew cookie is my favorite. Just 2 ingredients cashews and dates. Yum yum. Lara bars are the best for that mid-day pick me up!!! Key lime! Limes, almonds, cashews, dates, and coconut! Omg I’m obsessed with Larabars! You NEED to try the PB&J one! My favorite Larabar is the Peanut butter chocolate chip bar: Dates, Peanuts, chocolate chips, and sea salt! I cant go a single week without eating one! I LOVE cashew cookie– just cashews and dates! They’re the perfect snack during a long day of lectures in grad school! Love the Cashew Cookie!! Just 2 ingredients, cashews and dates. Yum yum. 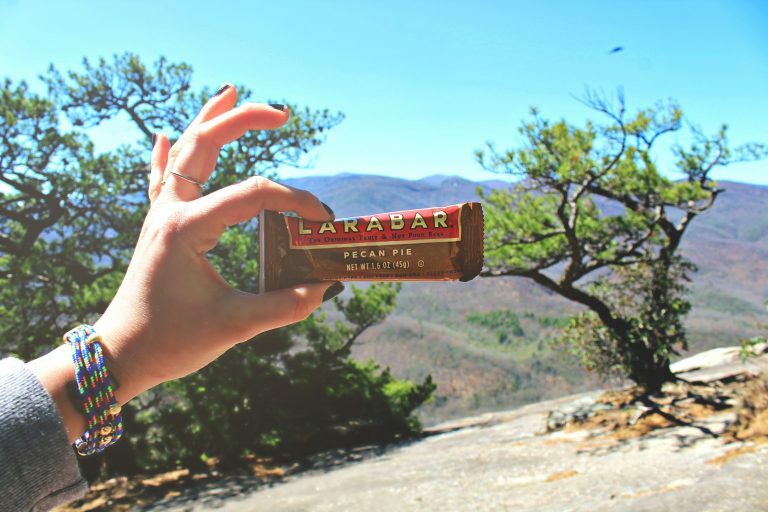 Lara bars are the ultimate best for that mid-day pick me up. All ingredients that are easily pronounced — got to love that! My favorite ever is the Coconut Cream Pie, 5 ingredients: dates, unsweetened coconut, almonds, cashews, extra virgin coconut oil. I started eat this for whole 30 and I couldn’t stop. I love it. Blueberry Muffin please! Love the minimal ingredients and carb/fat ratio. Perfect for a needed snack or to get the day started. Coconut chocolate chip is my favorite because it tastes JUST like a Mounds bar!!! Dates, unsweetened coconut, semisweet chocolate chips, almonds and cashews!!! Choc Chip Brownie, for sure! Dates, chocolate chips, almonds, walnuts, cocoa powder & sea salt! Yum! ? So I must be living under a rock……Ive always stuck to Kind bars but after reading your blog, picked up the Larabar mini 10 ct box at target with two flavors: cashew cookie and apple pie, the winner was apple pie but they were both good!! Ate one before my RPM spin class and had one while cooking lunch to hold me over. What a great giveaway, can’t wait to try the other flavors! Apple pie bar: dates, almonds, unsweetened apples, walnuts, raisins, cinammon. Peanut butter chocolate chip: dates, peanuts, chocolate chips and sea salt. Yum ? Currently pregnant and craving all things mint! The mint chip one would be a perfect alternative to mint chocolate chip ice cream. It has dates, almonds, cashless, chocolate chips, mint, and cocoa powder. Larabars are amazing!!! Banana Bread is my favorite. And it only has three ingredients! ALMONDS, DATES, UNSWEETENED BANANAS What?! That’s crazy!! I love the mini’s-perfect portion control! I want to try the Cherry Chocolate Chip Torte- Dates, chocolate chips, almonds, cherries, cashews and salt! I love the peanut butter cookie and how it’s only THREE ingredients! Dates, peanuts & sea salt! I love chocolate, but I’m going to say lemon. Ingredients: dates, cashews, almonds, lemon juice concentrate, dried lemon juice concentrate, and lemon oil. My favorite is the blueberry muffin! I love them. They were so perfect for me last week, when I had my wisdom teeth removed and still needed softer foods. They don’t lack texture, though! my favorite flavor is cashew cookie made with only cashews and dates!!! simple is best. Chocolate chip brownie…. only ingredients are DATES, CHOCOLATE CHIPS, ALMONDS, WALNUTS, COCOA POWDER, SEA SALT. I love chocolate, but I’m going to have to go with lemon! Ingredients: Dates, cashews, almonds, lemon juice concentrate, dried lemon juice concentrate, lemon oil. My favorite flavor is the coconut chocolate chip. The ingredients are: dates, semisweet chocolate chips, unsweetened coconut, cashews, and almonds! I also LOVE Larabars. My go to snack bar. I became addicted to their Cashew Cookie. 2 Ingredients! Cashews and dates. SO delicious! Banana bread <3 bananas, dates, almonds make for the perfect afternoon snack! I’ve never had a Larabar before. I’ve seen them in photos on your blog but I’ve always tried to stay away from pre packaged food. I am happy to see that these bars are heathy and contain ingredients I can actual pronounce. I went to the website and I thought that the seed and nut maple cinnamon bar looked delicious. It contains almonds, honey, chia seeds, maple syrup, cinnamon, coconut oil and sea salt. I will have to try it. Chocolate Chip Cookie Dough – with 4 simple ingredients what is there not to love, every bar has Dates/Sea Salt/Chocolate Chips and Cashews, its a figure friendly heart friendly snack. I haven’t tried that many lara bars because they isn’t a large selection near by, but of the ones I have tasted I absolutely LOVE peanut butter chocolate chip. It has dates, peanuts, chocolate chips and sea salt! Peanut butter chocolate chip!! The ingredients are peanuts, dates, chocolate chips and sea salt.. it helps with my craving for peanut butter cups while still eating quality ingredients!! I love love love Chocolate Chip Cookie Dough with only Dates/Sea Salt/Chocolate Chips and Cashews. What’s not to love! My favorite flavor is Cappuccino! It only has 5 ingredients: dates, almonds, cashews, fair trade coffee and vanilla extract. I’ve never had the Chocolate Chip Brownie flavor before, but now that one is next on my list! Coconut Cream Pie!! I’m obsessed with Coconut ANYTHING! Key Lime Pie is my favorite with 6 ingredients: Dates, Cashews, Almonds, Unsweetened coconut, Lime juice concentrate, and Dried lime juice concentrate. Chocolate Chip Cookie Dough is my current fave!!!!! Each bar only contains 4 simple ingredients. Cashews/Dates/Chocolate Chips and Sea Salt. Every bar is Kosher Vegan Non-GMO Dairy Free Gluten Free . What’s not to love! Plus they come in so many varieties you can never get bored. Chocolate Chip Cookie Dough is the best! I can’t believe it’s only cashews, dates, chocolate and seat salt! I always love trying new ones though because you never know when you’ll find a new favorite! cannot believe there are so many flavors! i am huge mint choc chip ice cream fan so anything that can steer me in a healthy way towards that flavor is a perfect match for me! my fav is for sure peanut butter chocolate chip. CANNOT GET ENOUGH + I eat one almost daily. the ingredients are dates, peanuts, chocolate chips, & salt. My fave is Key Lime Pie! 6 ingredients: Dates, Cashews, Almonds, Unsweetened coconut, Lime juice concentrate, and Dried lime juice concentrate! My favorite Larabar is the Chocolate Chip Cookie Dough, it contains cashes, dates, chocolate chips and sea salt! I would LOVE to try other flavors as I am striving towards a healthier lifestyle for 2017. I LOVE all of Larabar’s fruity flavors. It is so hard to pick just one as my favorite, but I think I’d have to say the Lemon Bar! It has dates, cashews, almonds, lemon juice concentrate, dried lemon juice, and lemon oil. I love to keep them in my car for a quick snack while I’m on the road! As a traveling therapist, Lara Bars stashed in my car help make a day of running around a little sweeter! I totally stand by any brand that can use real ingredients to make something so delicious. My favorite flavor is Chocolate Chip Cookie Dough too!! Chocolate chip cookie dough all the way!! Cashews, dates, chocolate chips, and salt.. whats not to love about that? I love Larabars, especially the lemon ones but their bites are so delicious! My favorite Larabars bites are the chocolate macaroon, which have dates, chocolate chips, almonds, coconut, and coconut flour!? I would love to win the prize pack so I can try the other flavors! Thanks for the opportunity and happy early birthday! The Cappucino!! Coffee, dates, almonds, cashews and vanilla beans! Sooooo delicious. What an awesome giveaway! Hey taralynn! 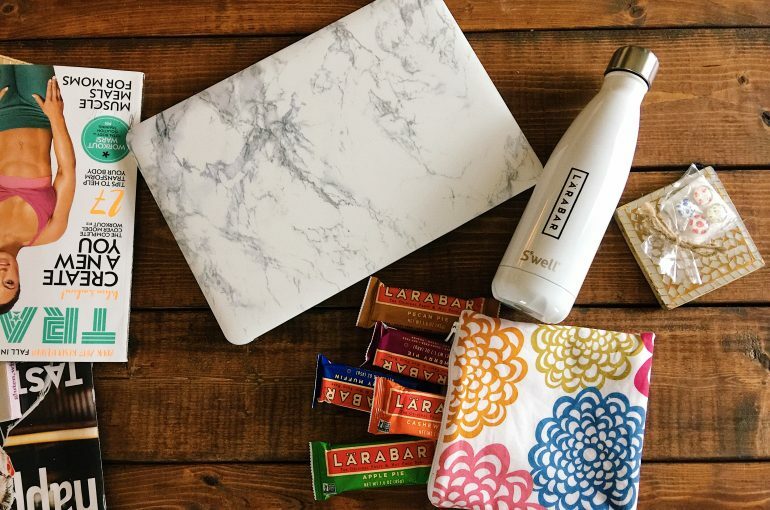 I feel like I could have written this post- I call the larabar in my purse and backpack my “emergency hangry bar”!! My favorite flavor is a tie between Apple pie and peanut butter chocolate chip! You can never have enough Larabars!!! My favorite Larabar flavor is Peanut Butter Chocolate Chip! It tastes just like a Reese’s but is so much healthier with only 4 ingredients- dates, peanuts, chocolate chips and salt. I don’t know how they make it so good with such few ingredients, but it totally works! I’ve been a huge Larabar fan for years! My favorite flavor used to be Blueberry Pie, but peanut butter chocolate chip has taken the lead. Plus, it only has four ingredients: Dates, peanuts, sea salt and chocolate chips! Also – the Larabar “bites” are amazing! The perfect sweet treat after a meal! I absolutely LOVE Larabars! My favorite hands down is the peanut butter chocolate chip flavor. I love PB & chocolate, especially together, so this one is hard to beat. It has dates, peanuts, chocolate chips, and sea salt. I’m dying to try the pumpkin pie and gingerbread flavors since they’re seasonal, but so far haven’t had any luck catching them! Omgggg my favorite is Blueberry Muffin!! It has dates, cashews, unsweetened blueberries, blueberry juice concentrate, lemon juice concentrate, and vanilla extract. I’m gonna be honest I put off trying this one forever because I didn’t think I’d like the dates but now I’m legit addicted to them. They always live in my bag and my friends are always rummaging thru my bag to find themselves a snack lol. I have been eating these for as long as I can remember. I usually get them at Target because they have the biggest selection! They really are the best fuel for before & after workouts! My favorite is the chocolate chip brownie! It has dates, chocolate chips, almonds, walnuts, cocoa powder and sea salt. I love adding it to vanilla yogurt when I really have a sweet tooth! I’m obsessed with the Cherry pie bar! The only ingredients are dried cherries, dates and almonds. I actually tried to make them myself over Christmas but the consistency didn’t turn out right (too much water). I’ve only tried a couple Larabar flavors so I’d love to try more!! I’ve tried a few Larabars before, but I’d like to try the coconut chocolate chip or the chocolate chip brownie flavors! While its so hard to choose a favorite flavor, the one i find myself going for the most is the Cashew Cookie! The ingredients are just Cashews and dates. We get these in my office as snacks and I love having a quick and healthy snack option when afternoon hunger hits! I love❤️ the peanut butter chocolate chip flavor with dates,peanuts,chocolate chips,and sea salt. Peanut butter cookie for me! I love that it only has a handful of ingredients: dates, peanuts, and sea salt. 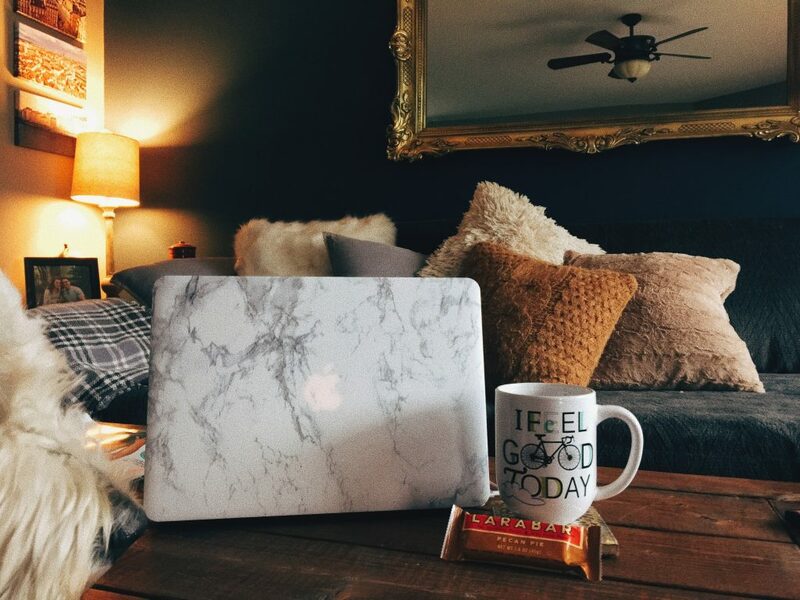 Perfect for the mid-afternoon work break. My favorite LARABAR is peanut butter chocolate chip, which is my go-to flavor for most sweet things! Even when I want to try new flavors, it’s tough to pass up. INGREDIENTS: DATES, PEANUTS, CHOCOLATE CHIPS, SEA SALT. Peanut butter cookie for me. I love that it only has a handful of ingredients: dates, peanuts, and sea salt. Perfect snack for the mid-afternoon work break. Definitely apple pie with dates, almonds. Walnuts, raisins and cinnamon! Coconut Chocolate Chip – Dates, chocolate chip, unsweetened coconut, cashews and almonds. Yum! Cashew cookie, is my favorite – just cashews and dates! It is a tie but my favorites revolve around chocolate! OMG!! Coconut is by far my favorite!!! I love larabars!! My favorite is the coconut cream: coconuts, dates, cashews, and extra virgin coconut oil! Peanut Butter Chocolate Chip! FOUR ingredients: dates, peanuts, chocolate chips & sea salt. I absolutely LOVE Lärabars and cannot live without them! My favorite flavor is coconut chocolate chip (dates, semisweet chocolate chips, unsweetened coconut, cashews, and almonds). Whenever I am doing a round of Whole30 these are such a lifesaver for me especially when I am on the go and know I will be going a while between meals. My favorite flavor for Whole30 is definitely the carrot cake (dates, almonds, walnuts, raisins, dried pineapple, unsweetened coconut, carrots, cinnamon, and extra virgin coconut oil). Such a great dose of healthy fats in this one! Peanut Butter & Jelly! Dates, peanuts, unsweetened cherries, and sea salt. Love Lara bars when I’m on the go! I love Larabar! My favorite is chocolate chip cookie dough. I definitely need to get my hands on this cappuccino bar ! Dates, Almonds, Cashews, Fair Trade Certified Coffee, and Vanilla Extract. It sounds amazing! My all time favorite is the peanut butter chocolate chip! It has dates, chocolate chips, sea salt, and peanuts – perfect for after my workouts! I also love that it is compliant with Whole30, which makes it an easy snack for on the go!! I cannot control myself when I see Larabars at the store, so needless to say I have tried them all! (and loved every bite) but my absolute favorite is the Key Lime Pie (Ingredients: Dates, Cashews, Almonds, Unsweetened coconut, Lime juice concentrate and dried lime juice concentrate). I was skeptical at first because it sounded very different from many of their other flavors, but I was blown away! It’s so tasty and refreshing! Most importantly, satisfying and good for me! I love indulging on healthy foods. Thank you Larabar! Chocolate Coconut Chew is definitely my favorite LARA bar, with Lemon as a close second. It satisfies my sweet tooth without me feeling guilty. The only ingredients are dates, walnuts, almonds, unsweetened cocoa powder, and unsweetened coconut. Try it if you haven’t!! You’ve sold me on the banana bread one with just almonds, dates, and bananas. Sounds delish! Coconut Cream Pie! Dates, Unsweetened shredded coconut, Almonds, Cashews, Coconut oil! Chocolate Chip Cookie Dough! Cashews, Dates, Chocolate Chips, and Sea Salt! My favorite LARA bar is the Chocolate Coconut Chew, with Lemon coming in a close 2nd. It hits the spot when I need something to satisfy my sweet tooth 🙂 The only 5 ingredients are dates, almonds, walnuts, unsweetened cocoa powder, and unsweetened coconut. Try it, if you haven’t! My absolute favorite Lara bar is the apple pie! I’m also obsessed with these bars and love how the ingredients are real food and so simple! I love Lara Bars! Also, love how many are Whole30 approved too! My favorite right now is Carrot Cake. The ingredients are carrots, dates, almonds, walnuts, raisins, pineapple, and coconut! Peanut Butter Chocolate Chip all the way! There is no better combination than peanut butter and chocolate. Love the simple ingredients in these bars, just DATES, PEANUTS, CHOCOLATE CHIPS, and SEA SALT! I’ve never had Larabar before but am excited to try them! The Chocolate Chip Cookie Dough one looks so good and I love that it only has simple ingredients-cashews, dates, chocolate chips, and sea salt! Thanks for sharing your review of them. LARABARS are my favorite! They are the perfect go-to snack, breakfast, or pretty much whenever your hungry! And the best part is that they are so satisfying! YUM! Larabars look delicious! I, too, am a chocoholic, so Chocolate Chip Cookie dough and Chocolate Chip Brownie both sound 100% up my alley! With only 4 and 6 ingredients each, I don’t have to worry about what I’m putting into my body being overly processed and unhealthy. First off- HAPPY BIRTHDAY ???? Second- I lovvveee the pumpkin pie larabars (color me basic!) they have dates, pumpkin, cashews, almonds, cinnamon, ginger, nutmeg and allspice. I love Lara’s mission to make clean foods accessible. They are the best! Just dates, unsweetened coconut, almonds, cashews, and extra virgin coconut oil! Woot!! I LOVE LARABARS! As a college vegetarian, I’m always between classes, labs, study sessions, and workouts. These bars help tide me over between meals (college meal plans are always a blast haha).I love that Larabars have so few ingredients, and my absolute favorite, cherry pie, has ONLY 3– dates, almonds and cherries! I LOVE Larabar peanut butter chocolate chip, and so many others. I also use it mostly for pre-workout and as a snack – there is always one in my purse. Great prize giveaway! 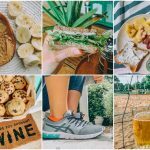 Your blog also brought Larabars into my life and I was SO HAPPY to find that many of them are whole 30 compliant (something I do regularly as I have a host of allergies.) The simple ingredients make snacking and fueling SO SIMPLE. My favorite is also the Chocolate Chip Cookie Dough (cashews, dates, chocolate chips, sea salt) but I also really like the Cashew Cookie (just cashews and dates!) Thanks for giving us a constant glimpse into your life, I so enjoy reading about you and all your endeavors! Love Larabars ❤ Peanutbutter Chocolate Chip is the best! Dates, peanuts, chocolate chips and sea salt ? So so yummy! I absolutely LOVE Larabars! The Chocolate Chip Cookie Dough is my favorite flavor too! I can’t get enough of those four ingredients: CASHEWS, DATES, CHOCOLATE CHIPS & SEA SALT! If you’ve never tried the Larabar BITES – you have to! I keep a bag of the Double Chocolate Brownie Bites in my purse at all times. PS you share a birthday with both my sister AND my dog Franny! The chocolate chip cookie dough bar is my favorite hands down ??? I love the simple ingredients in these bars! Cashews, dates, chocolate chips, and sea salt are the ingredients in the cookie dough bar. LOVE ❤️ I really want to get my hands on the brownie one and give that a try soon! The chocolate chip cookie dough one is my favorite hands down ??? I love the simple ingredients of these bars! Just cashews, dates, chocolate chips, and sea salt are the ingredients in the cookie dough bar! LOVE ❤️ I am really wanting to get my hands on the Brownie bar and give that one a try! I love most of the larabar flavors, but my favorite is peanut butter cookie with dates, peanuts, and sea salt!! I love anything chocolate and one of my favorite larabar flavors is chocolate coconut chew. Ingredients are dates, almonds, walnuts, unsweetened cocoa powder, and unsweetened coconut. While looking on the website I saw so many flavors I’ve never seen before. I would love to try the mint chocolate chip or the cappuccino flavor. Yum! I really want to try Cappuccino!!! Dates, almonds, cashews, fair trade certified coffee, vanilla extract! Ingredients: dates, almonds, semisweet chocolate chips, cashews, cocoa powder, and peppermint oil. My availability Larabar is the Key lime! It has dates, cashews, almonds, coconut, and lime juice – yummmm!!! Would adore the chance to try other flavors! Cappuccino! Coffee, dates, almonds, cashews, and vanilla extract!! My favorite flavor is the Cashew Cookie and I love that it’s only 2 ingredients: Cashews and dates!! The lemon is my favorite but that’s no surprise to me because I am a lemon lover! It has almonds, dates, cashews, lemon oil, lemon juice concentrate and dried lemon juice concentrate. I’m a veterinary student so I don’t have a lot of time between school and studying and work…these bars save me when I don’t have time to make dinner and during late night study sessions. I haven’t tried too many, but I love lemon! I want to try the chocolate chip cookie and blueberry. I love the apple pie flavor! I keep a box right on my desk at work for the emergency 3 o clock munchies. Ingredients: Dates, almonds, unsweetened apples, walnuts, raisins, cinnamon. I eat a larabar before every run!!! My favorite is the mint chocolate!!! I would be lost without these bars. So few ingredients and so tasty!!! Thank you for promoting a great product. I am obsessed with the Blueberry Muffin bar!! It only has blueberry juice concentrate, vanilla extract, cashews, lemon juice concentrate and unsweetened blueberries!! My go-to is the Coconut Chocolate Chip but I’m dying to try the Organic with Superfoods line! They all look so delicious and the perfecty healthy snack on the go! I haven’t tried Larabars yet but my husband loves them! I’ve been on an elimination diet the last couple of weeks to try to get to the root of some stomach issues and it’s pretty restrictive – these seem like they would be a great snack! Dates, almonds, cashews, fair trade certified coffee & vanilla extract. Honestly they are all incredible I have yet to try a Larabar I didn’t instantly fall in love with. It’s a toss up between Cherry Pie and Peanut Butter Cookie…but Peanut Butter Cookie definitely wins (peanuts, dates, and sea salt!! I love the apple pie flavor! I would love to win! I think it’s awesome that Larabar limits their ingredients to less than 9! Wow! The Apple Pie is usually my “go-to” but the Snickerdoodle is my jam!! Whenever I see it in stores for the winter season I stock up. Ingredients: dates, cashews, almonds, cinnamon, sea salt, and vanilla extract. Pair with your coffee and you’ve got a yummy treat! Made with all real ingredients: Dates, semisweet chocolate chips, unsweetened coconut, cashews and almonds. Cherry pie is my fav- cherries, dates and almonds. I recently discovered that they sell minis. I’ve only been able to find them at target (and only a few flavor options), so I stock up when I’m there. The minis are perfect for a little snack! I love peanut butter and jelly! My absolute favorite Larabar is the Gingerbread! It has dates, cashews, almonds, raisins, cinnamon, ginger, allspice and vanilla extract. But I have loved every Larabar I have had! I need to get my hands on the cappuccino one! It’s got dates, fair trade coffee, almonds, cashews and vanilla extract. I love having a coconut chocolate chip bar before going on long runs or after dinner as my dessert. Just enough sweet and super satisfying ? I love the chocolate chip cookie dough…ingredients only being chocolate chips, sea salt, cashews, and dates makes it even better! Although I’m not the biggest fan of the new Larabar commercial (it’s dangerous for folks who have disordered ways of thinking about their diet), I do love Larabras themselves. My favorite bar is the Chocolate Chip Cookie Dough with cashews, dates, chocolate chips, and sea salt. I LOVE Larabar!! My fave is the peanut butter chocolate chip larabar 🙂 Four ingredients: peanuts, sea salt, dates, and chocolate!! My favorite thing to do for desert or a snack is warm it for 20 seconds and then cut it up and put it on top of some plain (or whatever kind!) Greek Yogurt..and it’s like I’m eating a warm brownie with ice cream…except even better!! My favorite LARABAR is peanut butter chocolate chip!! The ingredients are dates, peanuts, semisweet chocolate chips and sea salt! Well, my small-town grocery store only stocks 3 flavors, and my favorite of those is the Chocolate Chip Cookie Dough. BUT, after checking out their website, I would love to try the Mint Chip Brownie with dates, almonds, semi-sweet chocolate chips, cashews, cocoa powder, and peppermint oil!! Dates, almonds, semi sweet chocolate chips, cashews, cocoa powder & peppermint oil! The reason I tried Larabars to begin with was because I had seen them on your blog and now I’m addicted! My favorite flavor is the Chocolate Chip Brownie made with dates, chocolate chips, almonds, cocoa powder, walnuts and sea salt. It’s the perfect snack to satisfy a sweet tooth while still making healthy choices. Love love love them!! The Peanut Butter Cookie is my jam! Anything that has PB and can be considered healthy, I’m in! First – you are my absolute favorite blogger in the history of bloggers and second, I love, love, love the pumpkin pie bar! It is only seasonal, but I stock up on it so I can have it all year long. I have a few others on my bucket list to try, though! LaraBars are the best bars EVER and so delicious. Love the Cherry Pie one! Perfect for dessert – 3 ingredients: dates, almonds and unsweetened cherries. My favorite is the peanut butter chocolate chip! It only has dates, peanuts, chocolate chips and sea salt. Easy way to stay healthy and yet feel like I am eating dessert! I love the peanut butter chocolate chip! Only four ingredients: dates, peanuts, chocolate chips and sea salt! Yum! I’m doing a Whole30 right now, and I just found out that LARABARS are compliant! My favorite flavor is hands down the Cherry Pie one, I love the tart cherries that tone down the sweetness of the bar. And the best part is that the only ingredients are dates, almonds, and cherries! But the LARABAR I’m most excited to try is definitely the Mint Chip Brownie! Dates, almonds, cashews, cocoa powder, chocolate chips, and mint are the only ingredients, and it sounds so decadent! obsessed with this flavor and i recommend it to everyone! although cherry pie and anything chocolate is a close second. Coconut Chocolate Chip: dates, semi-sweet chocolate chips, cashews, almonds, and unsweetened coconut. Peanut Butter Chocolate Chip is my favorite, and perfect for when the mid-afternoon craving for chocolate hits! Ingredients are dates, peanuts, semi-sweet chocolate chips (unsweetened chocolate, sugar, cocoa butter, vanilla), sea salt. I’ve only ever had the Apple Pie flavor (that’s all I’ve ever found in my area) but I LOVE them. I think if I ever had a chance to taste some of the other varieties, Chocolate Chip Cookie Dough would be my favorite. Its ingredients are cashews, dates, chocolate chips, and sea salt. I wish I had one right now! I love the Chocolate Chip Cookie Dough! Cashews, Dates, Chocolate Chips and Sea Salt! I love chocolate chip cookie and the cashew cookie! Mmmmmmm……the CHOCOLATE COCONUT! Mounds is a favorite candy bar of mine. This is a nice alternative! Helps with the sweet tooth and keeps this Mom on track! I love Larabar! Chocolate chip cookie dough is my favorite. I can’t believe it’s only got 4 ingredients! I love Banana Bread and Carrot Cake! I always have a box at home and at work, and am always finding random ones I’ve stuffed in my backpack and purses! I love the Chocolate Chip Brownie made with Fair Trade Certified™ chocolate chips and cocoa, dates, almonds, walnuts and 4 grams of fiber! My favorite is the pecan pie! Dates, pecans and almonds! I’m currently eating a paleo diet (Celiac for the win!) and crossfit and these bars have been awesome! My favorite is definitely Chocolate Chip Cookie Dough!! It has only FOUR ingredients: Cashews, Dates, Chocolate Chips & Sea Salt. So yummy! I haven’t tried them yet but I would LOVE to. Being a stay at home mom who’s trying to lose the baby weight and always reaching for the chocolate, the chocolate chip brownie sounds amazing to me; with the dates, chocolate chips, almonds, walnuts, cocoa powder and sea salt! Love Love Love Larabars! My favorite is definitely Chocolate Chip Cookie Dough! With the only ingredients being Cashews, Dates, Chocolate Chips, and Sea Salt… I feel like its pretty much a guilt free snack or treat! I am just discovering there is a Cappuccino Flavor?!? I will definitely be on the lookout for that one! My favorite bar is the peanut butter cookie!! The ingredients are DATES, PEANUTS, SEA SALT! That is it! I also have lara bars hidden in my purse & school bag. 🙂 I’m glad I looked at their site bc I saw many flavors not available in my area. I can’t wait to try them. Key Lime Pie is my favorite! Love the tad of tart. Ingredients: Dates. Cashews. Almonds. Unsweetened Coconut. Lime Juice Concentrate. Dried Lime Juice Concentrate. I absolutely LOVE Larabars. My husband and I can’t go without them. We try to buy them at BJs because they have amazing prices (less than $1 a bar)! Both stores near my house put them on sale 10 for $10 and I literally buy them out every time. We started eating them when we did Whole 30 last year and now they are a staple for us. Right now we have a box of Cashew Cookie (Cashews & Dates) which are my favorite, and Blueberry Muffin (cashews, dates, unsweetened blueberries, blueberry juice concentrate, lemon juice concentrate, and vanilla extract). When I have a sweet tooth though, I am all about the Peanut Butter Chocolate Chip (dates, peanuts, chocolate chips, and sea sat). Seriously amazing. My entire family is actually in love with Larabar and we all carry them on us at all times. I have four in my purse right now lol. One of my nieces first words was “larabar”!…. That and “croix” for LaCroix haha. I LOVE Larabars! I always stock up when we go to Target because I’ve found the best flavor selection there. So far the coconut cream pie is my favorite; I’m always amazed that they only have a handful of ingredients (dates, unsweetened coconut, almonds, cashews, and extra virgin coconut oil). I need to track down the coconut chocolate chip next! My favorite is the snickerdoodle flavor which is sadly a seasonal flavor. It has dates, almonds, cashews, salt, cinnamon, and vanilla. I have been eating larabars for years and I love the variety in flavors! Chocolate chip cookie dough..but I saw on their website they have a cappuccino – I want to try it! But, I’ve been wanting to get my hands on Banana Bread for MONTHS! I keep crossing my fingers it will pop up in the store! My favorite is Peanut Butter & Jelly! Blueberry Muffin is def my favorite!! The ingredients are: Dates,cashews, unsweetened blueberries, blueberry juice concentrate, lemon juice concentrate, and vanilla extract! I just bought a huge box of cookie dough and apple pie bars at costco last week! I am a big fan the peanut butter and jelly! It has peanuts, unsweetened cherries, dates, and sea salt! Im training for two trail 1/2 marathons that are set a week apart. I’ve really been focused on my training and larabars are an amazing pre-workout snack! My favorite is also Chocolate Chip Cookie Dough! I actually didn’t realize it had just 4 ingredients! Cashews, dates, chocolate chips and sea salt. I can’t believe just those 4 things make it so good! While reading your post you got me craving one. I went to the pantry to get one and I’m eating it right now! I LOVE Larabars and eat one almost everyday, but where I live flavours are limited and I’ve only gotten to try a couple. I love the chocolate chip cookie dough but my absolute FAV is the lemon! I swear I’d be the happiest girl in the world if I won this. I love the mint chocolate Larabar bites that have just dates, almonds, chocolate chips, cocoa powder, peppermint oil, and coconut flour! Cherry pie for sure! Unsweetened cherries, dates and almonds ? Gingerbread is my favorite!! I am obsessed with seasonal flavors! The ingredients are dates, cashews, almonds, raisins, cinnamon, ginger, all spice, and vanilla extract. 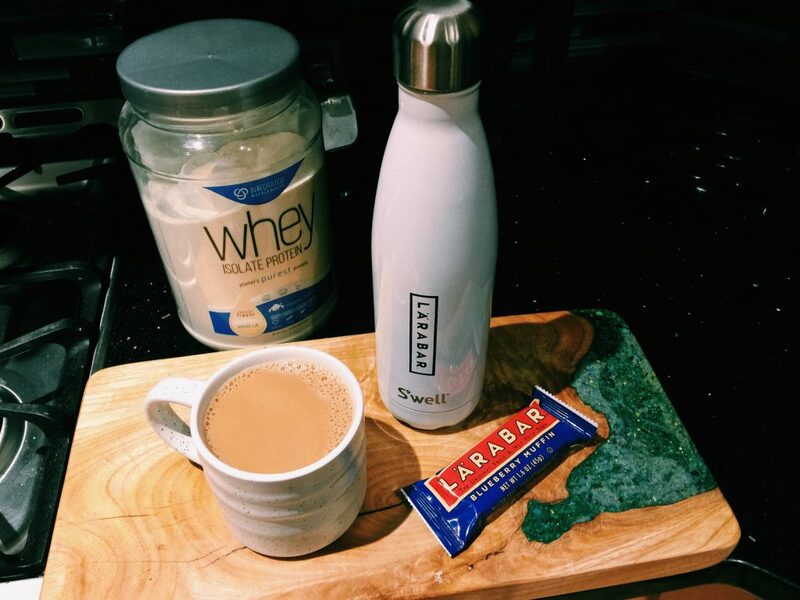 I love Lara Bars and S’well water bottles, so I’m all about this post! I’ve had the chocolate chip cookie dough a million times and love it! But I’d love to try the Cappuccino one that has dates, almonds, cashews, coffee and vanilla! I defiantly just added it to my shopping list for later today! I had no idea there were so many flavors… now I want to try them all! Chocolate Chip cookie dough= cashews, dates, chocolate chips, and sea salt! I have to agree with you and say Chocolate Chip Cookie Dough! Just cashews, dates, chocolate chips, and sea salt – so easy, yet so delicious! I haven’t tried them but the blueberry muffin sounds soooo good: DATES, CASHEWS, UNSWEETENED BLUEBERRIES, BLUEBERRY JUICE CONCENTRATE, LEMON JUICE CONCENTRATE, VANILLA EXTRACT. Yum – I’ve only tried a few flavors, but love the Peanut Butter chocolate chip: dates, peanuts, chocolate chips, and sea salt. The coconut cream pie is to die for! I’m a sucker for anything with banana in it! Chocolate Chip Cookie Dough!! I take one to work with me EVERY DAY! I get chocolate cravings like clockwork around 2pm and instead of eating candy, I eat my Larabar, and am totally satisfied! I love, love, LOVE this flavor. I have been following your blog for years and you have inspired me to eat clean, which is why I love that these bars have so little ingredients. It’s hard to believe this one only has cashews, dates, chocolate chips, and sea salt! 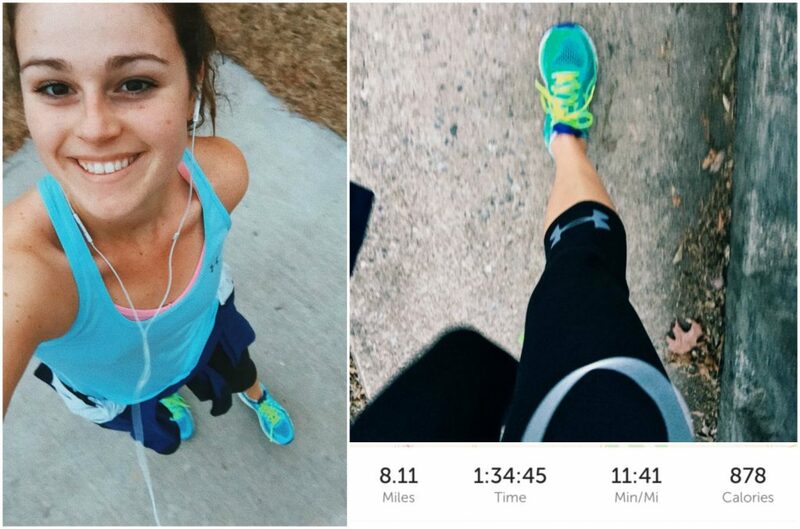 And because of you, I used to be a running hater, I am now also training for a half marathon! It’s the thing I look forward to most when I get home from work every day! Ingredients: Dates, unsweetened coconut, almonds, cashews, Extra virgin coconut oil! I love them all, but Blueberry Muffin is probably my favorite! . Blueberries, cashews and dates with a dash of lemon and vanilla. Cherry Pie! Super simple: dates, almonds and unsweetened cherries. I have only had the cashew cookie and apple pie ones before and they were both very good. -The one that sounds the best to me though is blueberry muffin. It has dates, cashews, unsweetened blueberries, blueberry juice concentrate, lemon juice concentrate, and vanilla extract! I love larabars! The peanut butter cookie is definitely my favorite! I’ve been obsessed with LaraBars since I did a report on them in college as one of the healthiest pre-packaged snacks! My favorites are definitely the peanut butter chocolate chip with peanuts, dates, chocolate chips, and sea salt and the coconut cream pie with dates, unsweetened coconut, coconut oil, almonds, and cashews. LOVE! Peanut butter cookies is ahhmazing! Dates, peanuts and sea salt. Key Lime Pie is my favorite! Love the tad of tartness. Ingredients: Dates, Cashews, Almonds, Unsweetened coconut, lime juice concentrate, dried lime juice concentrate. I love the blueberry muffin flavor! I am completely obsessed with blueberry muffins and it’s definitely a healthier option than grabbing an actual muffin all the time. Ingredients include blueberries, cashews, dates, lemon and vanilla. Yum! INGREDIENTS: DATES, SEMISWEET CHOCOLATE CHIPS, UNSWEETENED COCONUT, CASHEWS, ALMONDS nothing unhealthy for you. My favorite is definitely the Chocolate Chip Cookie Dough… made with JUST 4 INGREDIENTS (cashews, dates, chocolate chips, and sea salt). SO. GOOD. Chocolate chip coconut! Dates, semisweet chocolate chips, unsweetened coconut, cashews & almonds. That’s it! I keep a Larabar in my pocket at work usually. I work on an ambulance so if we are busy and don’t have time for lunch, I just eat that and it holds me over until we get back to the station. Coconut oil, Cinnamon, carrot, dried pineapple, coconut, raisin, walnuts, almonds, dates! YUM! Snickerdoodle! Ingredients: dates, cashews, almonds, cinnamon, sea salt, vanilla extract. PS – Leo totally looks like he’s smiling in the pictures above! Too funny. Blueberry Muffin: Dates, Cashews, Unsweetened Blueberries, Blueberry Juice Concentrate, Lemon Juice Concentrate, & Vanilla Extract! I think I accidentally deleted my other post! My favorite is the gingerbread! I was only able to get my hands on two of them last year before the end of the season! This year I am grabbing them up right away!! Pecan pie! So yummy! All of them that I have tried are so good. *Dates, pecans and almonds* So simple, yet SO tasty! Cherry pie! Ingredients are dates, almonds, and unsweetened cherries. I love the gingerbread: dates, cashews, almonds, raisins, cinnamon, ginger, allspice, and vanilla!!! Same as you!! Peanut butter chocolate chip are to die for. Dates, peanuts, chocolate chips and sea salt…who could pass that up? My husband and I eat them all the time along with others like peanut butter, coconut and the lemon. Yum yum. Thanks for sharing! I need this in my life! I recently started eating very clean and avoiding packaged and processed foods. I love that Larabar’s have minimal, clean ingredients. My favorite bar is the cashew cookie with only cashews and dates. I work full time and I’m a student so I’m constantly looking for healthy snacks I can eat on the go! Gingerbread!! Unfortunately I was only able to get my hands on 2 before the end of the season and they stopped being in stock! I know for this year to get a whole bunch early!!! Dates, cashews, almonds, raisins, cinnamon, ginger, allspice, vanilla extract. Just bought some yesterday! Cherry Pie is my favorite with only 3 ingredients: dates, almonds, unsweetened cherries! Perfect snack to take to school, work, after a run! Coconut chocolate chip is AMAZING!! <3 Hard to pick one top flavor but I cannot resist the combination of chocolate and coconut. The ingredients in my favorite flavor are dates, chocolate chips, coconut, cashews & almonds! Now I'm craving a larabar! Coconut Chocolate Chip is nothing short of AMAZING; dates, chocolate chips, coconut, cashews and almonds. Great mid-day snack between teaching. Lara bars keep me going. Coconut Cream Pie is my fav! Have one sitting at my desk right now- it has dates, unsweetened coconut, almonds, cashews, and extra virgin coconut oil. I LOVE the Lara bar lemon bar!! Dates, almonds and lemon zest!! I love just about every Larabar flavor! Snickerdoodle is awesome: just dates, cashews, almonds, cinnamon, sea salt & vanilla extract. But I haven’t tried the new FRUITS + GREENS flavors and would love to! Strawberry spinach cashew has strawberries, spinach, cashews, apricot & unsweetened apples. Yum! I also LOVE the apple pie. That one is a classic and has DATES, ALMONDS, UNSWEETENED APPLES, WALNUTS, RAISINS, CINNAMON. I used to have a larabar everyday in high school and I find they give great energy as their simple ingredients are so easy to digest. The bites look delicious as well and I would love to try them! My FAVORITE Lara bar is the blueberry muffin which has dates, cashews, unsweetened blueberries, blueberry juice concentrate l, lemon juice concentrate, and vanilla extract. If you have any shop rites down in North Carolina, they have the peanut butter jelly and chocolate chip brownie flavors! I just saw them at the store yesterday! Lara bars are my favorite go to snack! I don’t feel guilty eating them! It’s a relief to know they aren’t made with chemicals and processed foods! Peanut butter chocolate chip bar! It’s ingredients are dates, peanuts, chocolate chips, and sea salt! The lemon is my favorite by far and combines dates, cashews, almonds, and lemon! Lara bars bars the bestime! My favorite flavor is Cashew Cookie. Just dates & cashews! I LOVE Larabars probably as much as you do. All of the flavors are so yummy for the exception of Gingerbread, but only because I have never been a fan of that flavor in anything. The Peanut Butter Cookie is my favorite flavor . It’s great also because it contains DATES, which I could eat alone, but the PEANUTS and SEA SALT really tie the whole bar together! Chocolate brownie – choc chips, cocoa, dates, almonds, walnuts & 4g fibre! That’s it. I’d love to try out Larabar one day! They’re rather uncommon here though and hella expensive because it’s imported!! Worth the money though. Have you tried any Oatmega bars? So good, I’ve been buying them a lot lately. I LOVE taking Larabars up to the mountains when I go snowboarding, and I absolutely bring some for my “forgetful” friends that never bring snacks (trust me…. I know some of those hangry friends, ha!). We don’t like taking too many breaks to go down to lodge to eat (expensive) nachos, cheese fries, hamburgers, etc. And plus, those foods are way too heavy. My favorite flavors are PB chocolate chip and cashew cookie. I find it amazing that the cashew cookie only has two ingredients, my favorite ingredient is the cashew (duh)! **I will make a side note. I am SO grossed out by raisins/dates/craisins etc…like I hate them, but I still LOVE these bars. The date flavor does not bother me one bit. I adore Larabars for their simplicity and nutrition and I would LOVE to win! My favorite flavor of the moment is CASHEW COOKIE. Other flavors that are amazing: Cherry Pie, Apple Pie, PB&J, and Pecan Pie. Delish! I totally agree with everything you said about Larabars. These are my lifestyle bar for sure. I consider them a special treat after my long runs. On weekends, I used to head for a donut and chocolate milk to refuel after long runs. Now, I have a cashew cookie Larabar with almond milk. I feel just as satisfied, not at all sluggish, and have no guilt at all! The cashew cookie contains only 2 ingredients: dates and cashews! Hi Taralynn! I love that Lara Bars are only a few ingredients. My favorite is the coconut chocolate chip, with dates, semi sweet chocolate chips, cashews, almonds, and unsweetened coconut. My favorite flavor is the cherry pie! Only dates, almonds and cherries. Favorite LARABAR Flavor is Coconut Chocolate Chip! Ingredients are: dates, semisweet chocolate chips,unsweetened coconut, cashews, and almonds! Dates, semisweet chocolate chips, unsweetened coconut, cashews & almonds. Yum! I LOVE the Peanut Butter Cookie flavor! The dates are the ticket in the best flavor for these bars! Dates, semisweet chocolate chips, unsweetened coconut, cashews & almonds. Yum!! I completely agree with you! I absolutely LOVE the Chocolate Chip Cookie Dough! Seeing that it has cashews, dates, chocolate chips, and sea salt; It makes it easy to take to my college classes as well as having it after dinner with a cold glass of Soy milk! I loveeeeee the Cookie Dough one as well, but I’m intrigued to try the Pecan Pie one since my hubby loves Pecan Pie. It only has dates, pecans, and almonds, which are very different than the other (mostly non-healthy) items that go into a normal pecan pie. Plus, larabars tend to be just as tasty and much better for you! Happy Early Birthday! It has dates, almonds, unsweetened apples, walnuts, raisin and cinnamon. I love Larabars! I didn’t realize they had SEASONAL flavors!! AHH! My favorite would probably be the pumpkin pie! (because who doesn’t love pie?) There are 8 ingredients (half are just seasonings): dates, cashews, almonds, dried pumpkin, cinnamon, ginger, nutmeg, and allspice. I love the cashew cookie, it’s only cashews and dates, honestly didn’t know that! Harder to find, but I’m obsessed with the Snickerdoodle flavor. It contains dates, cashews, almonds, cinnamon, sea salt and vanilla extract. Wish I had one right now! Love Larabars. My favorite is the Blueberry Muffin flavor. I work full time and am in grad school, so I always have a few of these in my purse to snack on between class or before a workout. They’re good if you’re trying to cut back on added sugar. BUT I just saw there’s now a snickerdoodle flavor?!!?! Game changer. I need to find those guys and buy a box!! My favorite flavor is the peanut butter chocolate chip bar! It’s ingredients are just dates, peanuts, chocolate chips, and sea salt!! ? My fav larabar (peanut butter cookie) has only three ingredients- dates, peanuts and sea salt! I just did the Daniel Fast and lara bars were my saving grace. Love them! Has dates, cashews, almonds, lemon juice concentrate, dried lemon juice concentrate and lemon oil . Delish! Hi!! 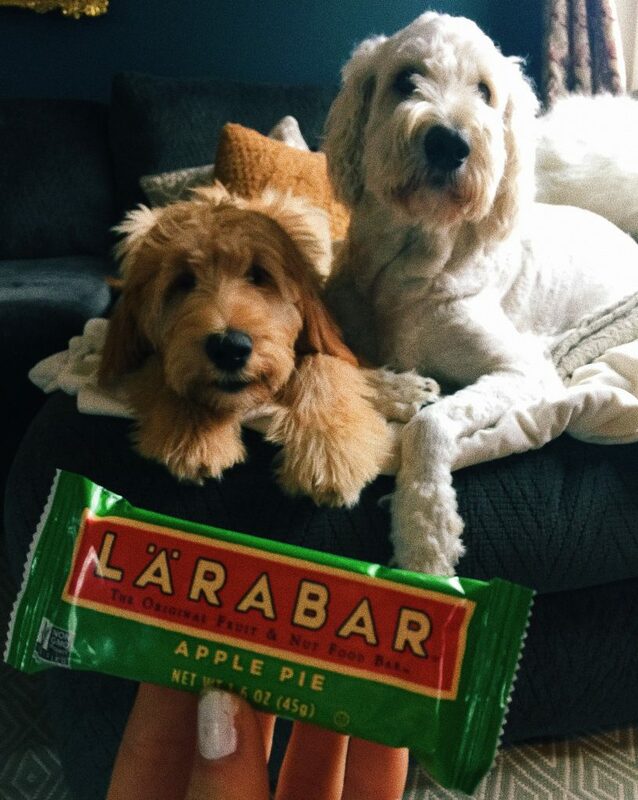 I also love Larabars…my favorite is the peanut butter cookie that has dates, peanuts, and sea salt! I would love to try the flavors you mentioned in your post..the pecan pie sounds yummy! These Larabar’s sound amazing! I think I would love the blueberry muffin bar packed with dates, cashews, unsweetened blueberries, blueberry juice concentrate, lemon juice concentrate, and vanilla extract! Sounds delicious! My fave has always been Cherry Pie, with cherries, dates and almonds. But the Carrot Cake looks super yummy, too. applie pie gets me every time! I love the Lara bar lemon bar!! Dates, almonds and lemon zest is so refreshing after a workout. Love the chocolate chip cookie dough! Only cashews, dates, chocolate chips, and sea salt! Cherry Pie- Just dates, almonds, and unsweetened cherries! Thanks for a great post this morning! I LOVE the lemon bar Larabar. It’s my favorite! I just started a clean eating program (the Whole 30), and these bars have seriously saved me. They’re the perfect snack before or after a workout, and they’re super handy on-the-go. With such healthy, simple ingredients, it’s impossible to go wrong! Chocolate chip cookie dough is definitely a keeper! My life is on the go a lot working in healthcare so, these are SO great for a quick snack before getting to another patient! Gluten Free PB Oatmeal Cookies W/Chocolate Chunks!